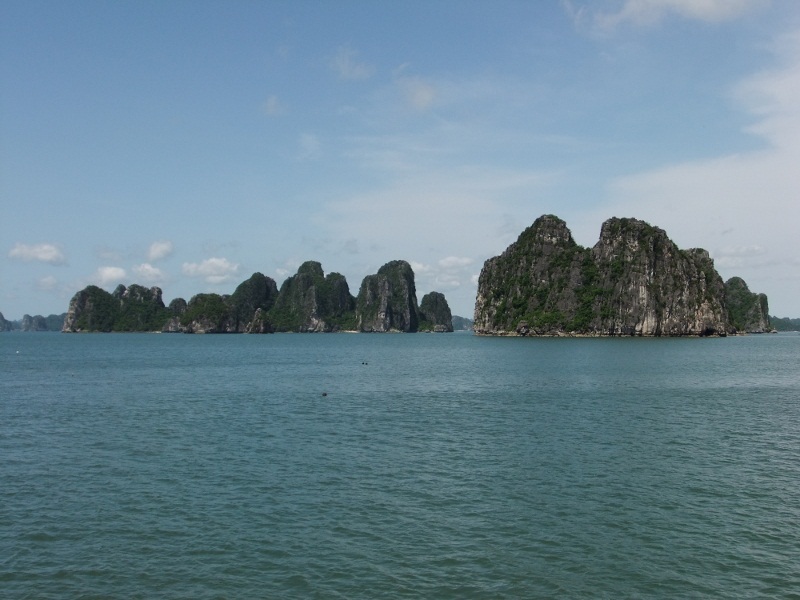 Any traveler in Vietnam will undoubtedly be told to visit the scenic area of Ha Long Bay. 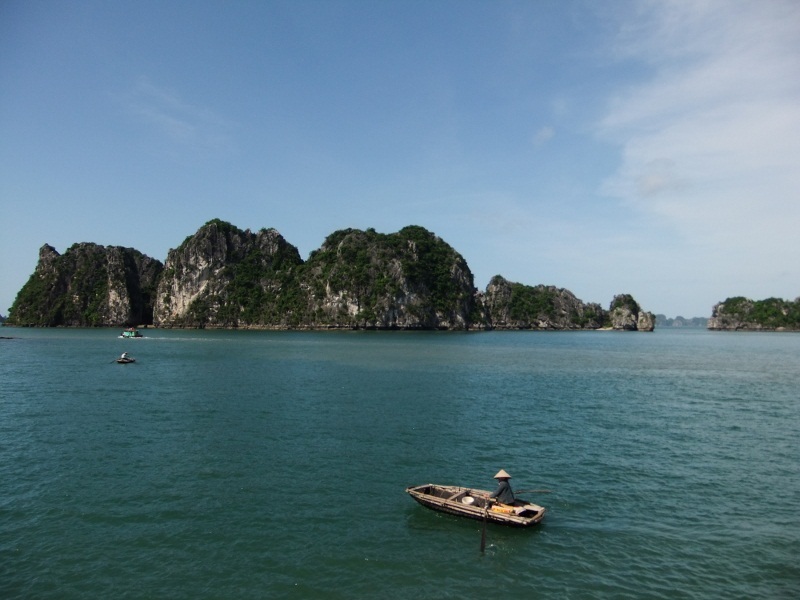 For decades, the limestone peaks of this coastal region in northern Vietnam have attracted tourists from far and wide. Sadly, its popularity and designation as a UNESCO World Heritage Site have turned this natural wonder into an absolute zoo. For us, there was nothing peaceful about the place; dozens of tour boats crowd the bay, tour operators aggressively try to fill their trips, and the water has become polluted from the thousands of people who visit each week. But don’t despair, another option still exists for those willing to put in a little extra effort. 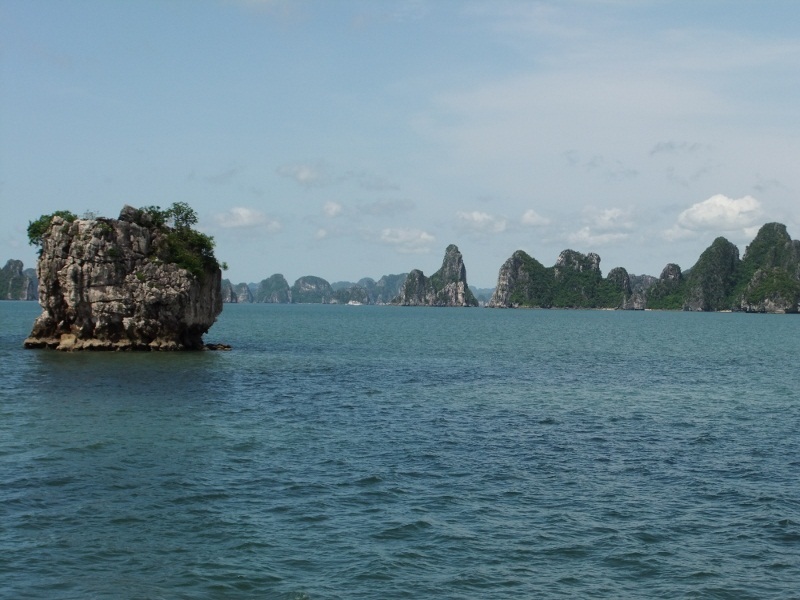 Adjacent to Ha Long is the area known as Bai Tu Long Bay. Like its neighbor, Bai Tu Long is home to countless limestone islands that rise sharply out of the turquoise waters and is relatively unaffected by the tourism industry. Why is Bai Tu Long better than Ha Long? The same beautiful views without the masses of tourist boats! We’ve said it before and we’ll say it again, we don’t like tour groups. 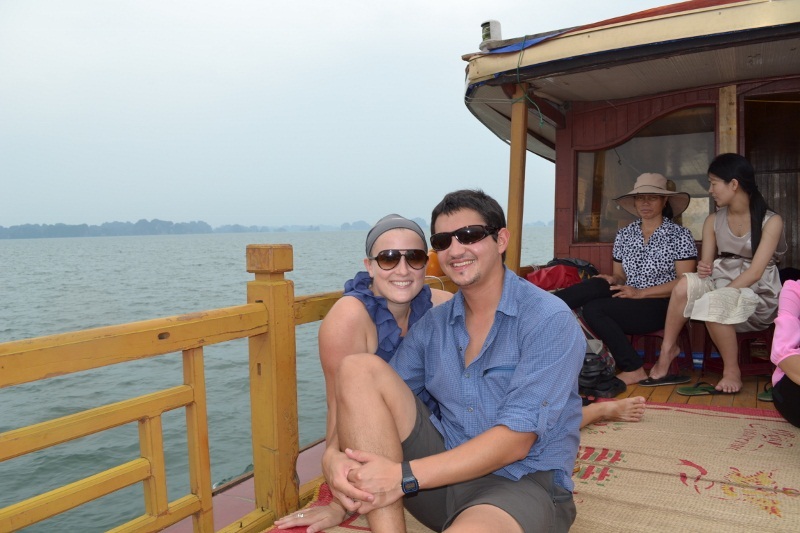 Several people in Hanoi tried to convince us that exploring Bai Tu Long on our own was impossible, but we took some advice from one of Amy’s brothers, did a little research and found a public ferry. We boarded a small wooden boat with locals that live on islands in the bay and set off into the landscape of towering peaks. Because we are constantly moving, it can be easy to lose sight of the amazing expedition that we are on. Ironically, the same thing happens to travelers that happens to people at work…days blend into weeks and weeks into months. However, being out on the waters of Bai Tu Long brought back our sense of adventure. The thrill of being on a rickety boat headed to a sparsely populated island with no idea of where we were going to sleep reminded us why we left home in the first place. Watch our video from the ferry ride through Bai Tu Long Bay here or by clicking on the image below. 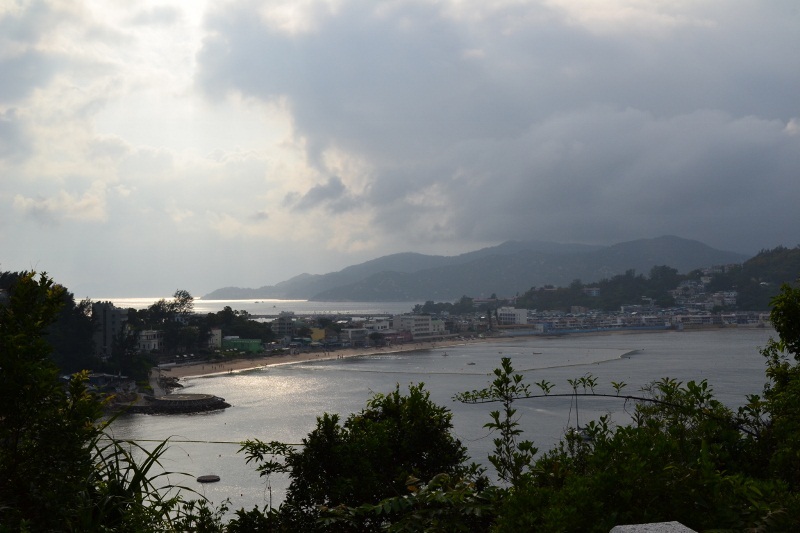 After a four hour boat journey, we docked at Quan Lan Island (pronounced Gwan-ah). This island is so remote that we were unable to find a map online prior to leaving the mainland, so we arrived with no idea of the layout of the land. Not surprisingly, there were numerous tuk-tuks waiting at the pier, so we jumped aboard and attempted to communicate that we wanted to go to a hotel, any hotel. The driver spoke zero English and gave us a blank look. He showed us 30,000 Dong and pointed to some small buildings in the distance. 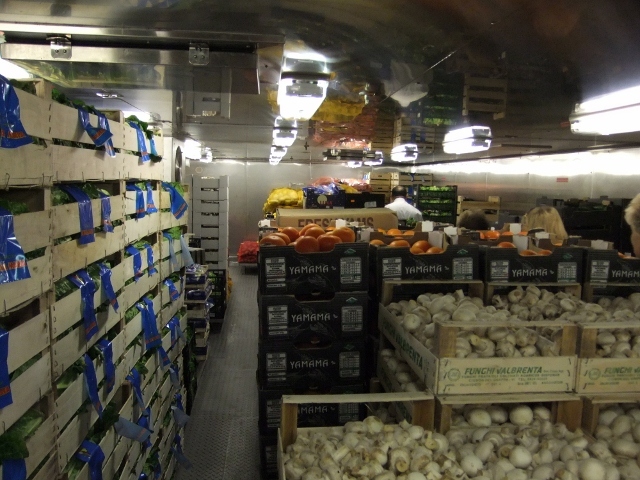 Having no other choice, we agreed to the price and were on our way. 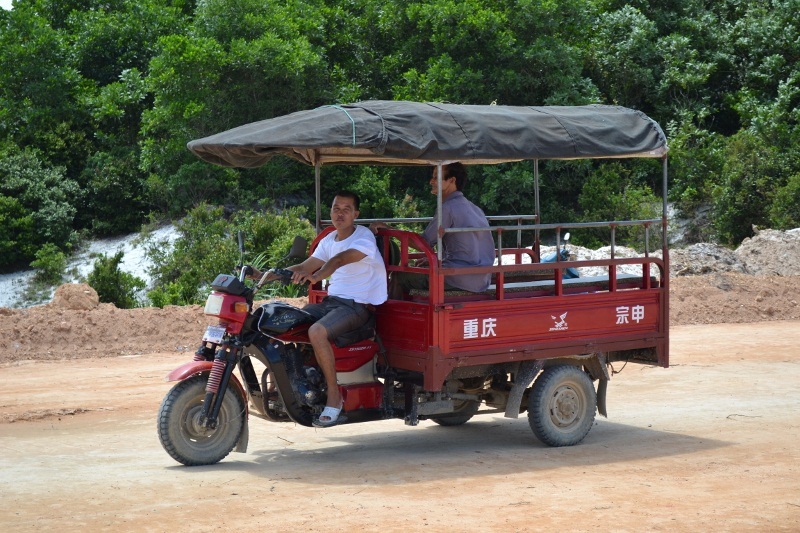 Tuk-tuks and motorbikes are the only method of transport on Quan Lan. Turns out there is no real town on the island, but there is one street that is home to a few mini-hotels, ALL of which double as restaurants, convenient stores and motorbike rental shops. They are very entrepreneurial people. 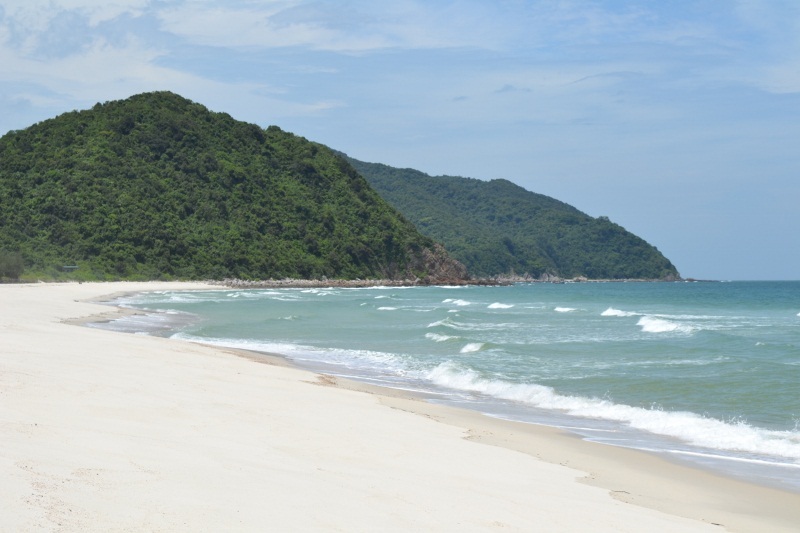 It was quickly apparent that aside from the limited lodging, there is little to no tourist infrastructure in Quan Lan, a refreshing change from Hanoi and Ha Long. In the morning, we rented a motorbike from our hotel (we are pretty sure that it was the owner’s personal motorbike) and took off down the road. 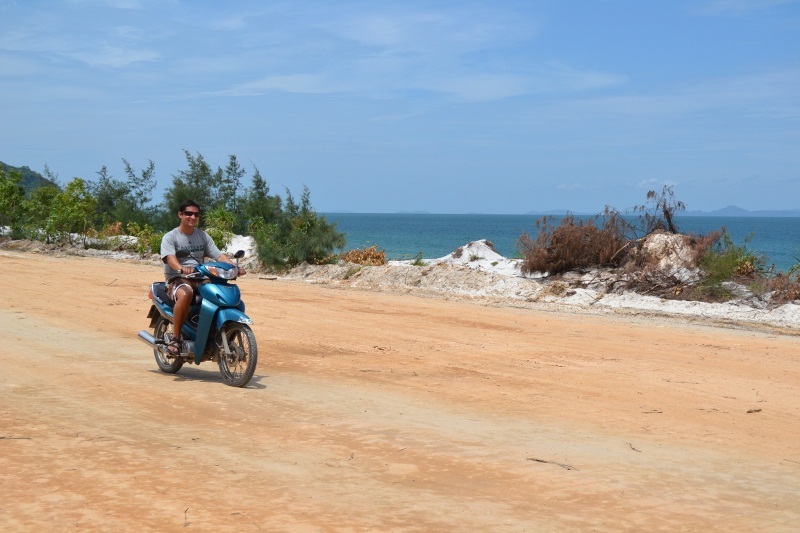 While we would never have attempted driving on the crazy streets of Hanoi, riding on Quan Lan was a piece of cake. Little to no traffic helped put us at ease, and having only one main road made getting lost on the island nearly impossible. Peaceful is the best word to describe this place; water buffalo roam the fields, rice paddies glisten in the sun, and waves crash onto white sand beaches. Our trip to this island can be summarized as a relaxing time on the beach. We didn’t do much else. The people of Quan Lan were some of the most friendly that we have encountered in Vietnam. Even though most do not speak a lick of English, we managed to have full conversations with people using impromptu sign language, and we were even invited into a family’s home for a crab dinner one night. It is clear that the influence of tourism has not yet ravaged this island, and we hope it stays this way. However, we weren’t the only tourists there, and we know that more will make the journey with each passing year. If you find yourself amongst them, please tread lightly. 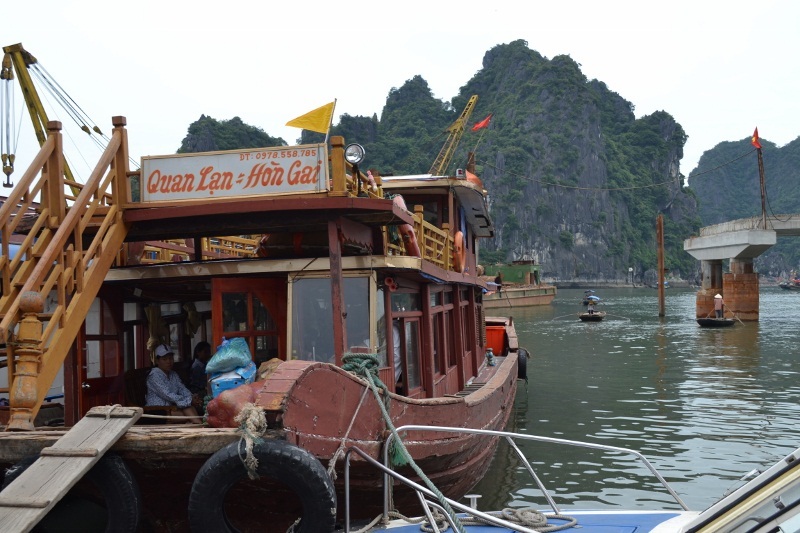 The public ferry from Hon Gai, through Bai Tu Long Bay, to Quan Lan Island was spectacularly beautiful. When combined with the laid back atmosphere and friendly people of the island, we found it to be a worthwhile alternative to Ha Long Bay. It has been a while since our last post. The reason? 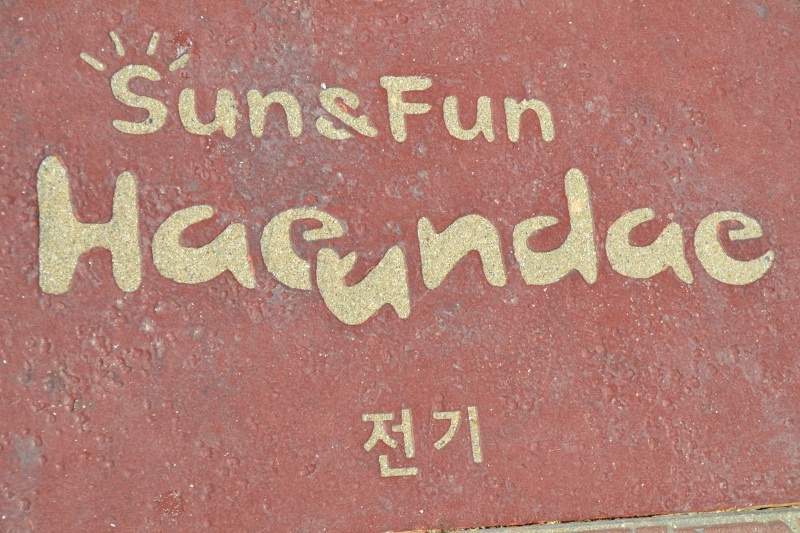 We have been bumming around on the beaches of Busan, South Korea for the past eight days. Before getting into our fun in the sun, we’ll take you back to our last moments in China. On our final night in Beijing, we liberated ourselves of the massive Lonely Planet China guidebook we had purchased and felt a great weight off our shoulders (both literally and metaphorically). Guidebooks can be a double-edged sword; they provide you with valuable information and are a one-stop shop for planning a trip, but they also leave you feeling like you have to see and do everything. We now know 100% that we prefer to travel without them. When all was said and done, we spent five weeks maneuvering the crowds, traffic and tourist hotspots of eight different Chinese cities. Don’t get us wrong, we loved China, it’s just that we were ready to plant ourselves in one place for a while. Simply stepping out of the airport in Busan had a very calming effect. People formed lines, cars stopped at cross walks, streets were clean and tidy and everything just seemed so smooth and orderly. 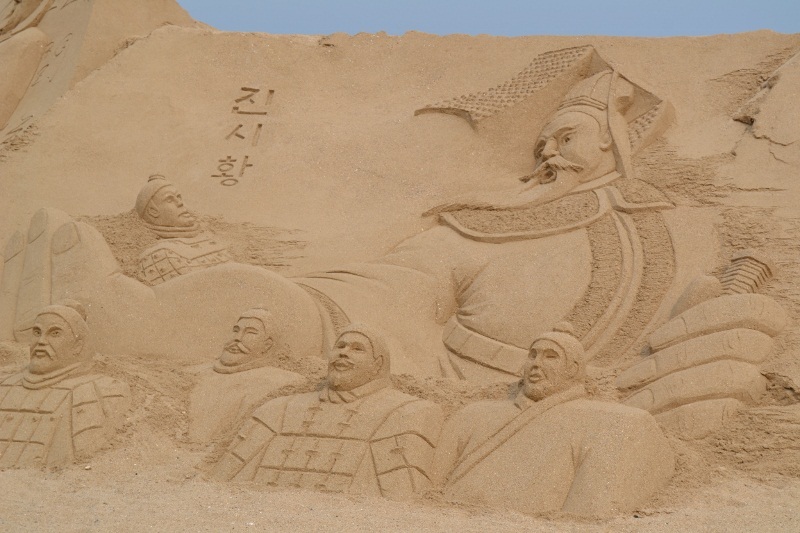 We knew that Busan was a city with some nice beaches, but to our surprise, there was an international sand festival taking place at Haeundae Beach, just minutes from our hostel. When it comes to de-stressing and just having fun, there are few things better than an ocean side festival. These guys make it look easy. We got inspired to create our own work of art. 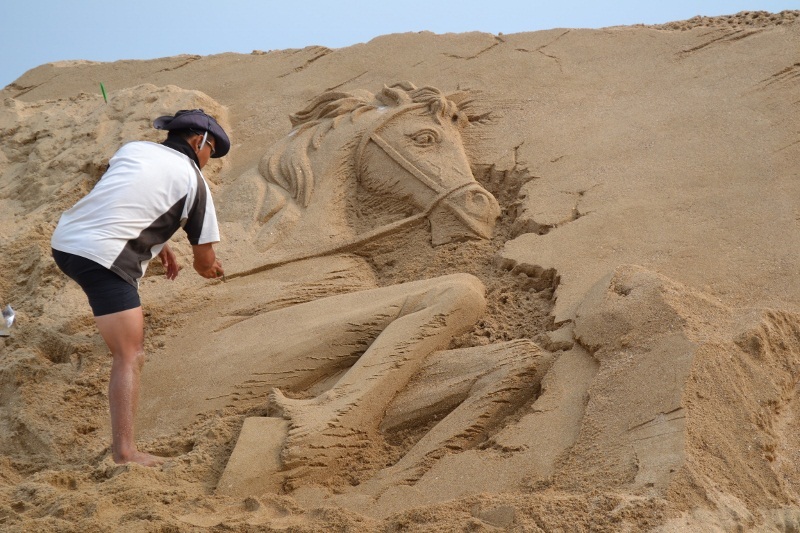 It was so much fun to play in the sand that day. Quite a few people even stopped to take photos of it, which made us feel like we were part of the festival. The sad part is how sore we were the next day, and for several days after. Don’t ask us what it is…we have no clue. At first, we had considered taking a train up to Seoul for a few days or setting off for some hiking in the nearby mountains; but, in the end our desire to just max on the beach prevailed. 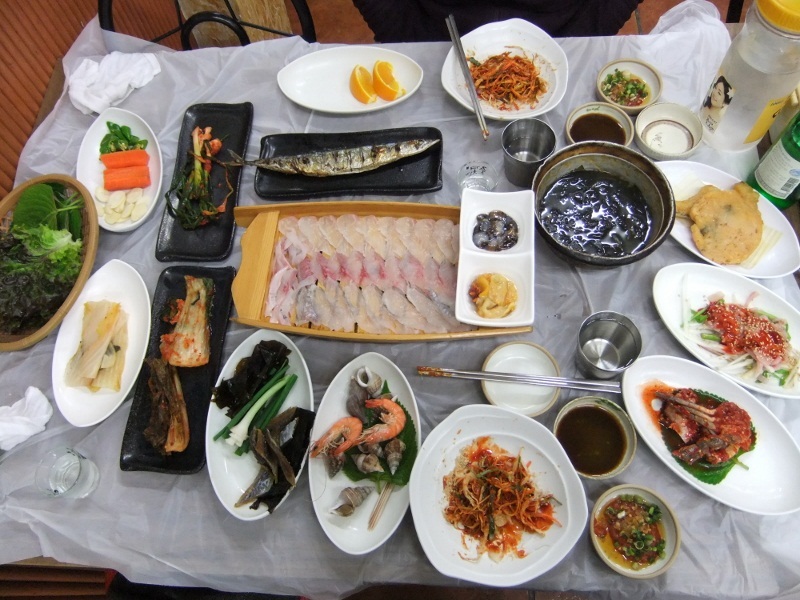 We decided that we could still experience many great aspects of Korean life, namely the food, without trekking very far. 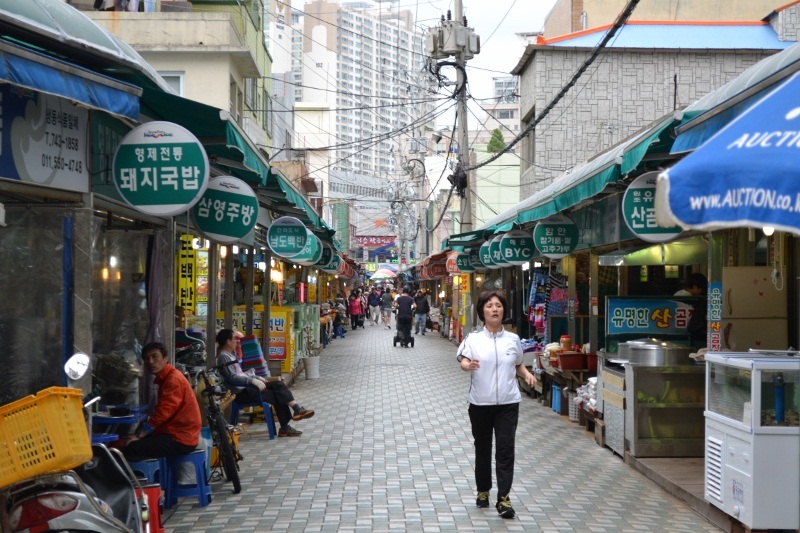 We had only to walk two minutes from our hostel to Haeundae Market to find many of the nation’s culinary delights. After just a day, this market became one of our favorite markets in the world. This lady served up the tasty tempura snacks day and night. 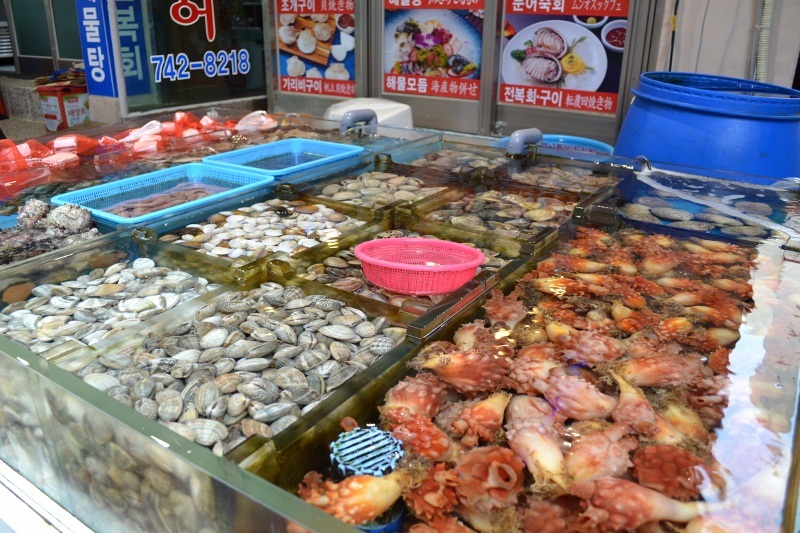 The amount of different sea creatures available at Haeundae Market is incredible. The combination of fresh seafood, delicious vegetables, hole-in-the-wall restaurants, street food and shops was perfect. We ate everything from kimchi dumplings, to sushi rolls, to tempura . One night, we even ate a meal that included 11 different types of sashimi: two species of eel, sea snails, crab, sea squirt, shrimp, sea cucumber, three unknown types of delicious sliced fish, and a whole grilled fish. Amazing spread of “hue” (pronounced hway), which is Korean sushi, and more! 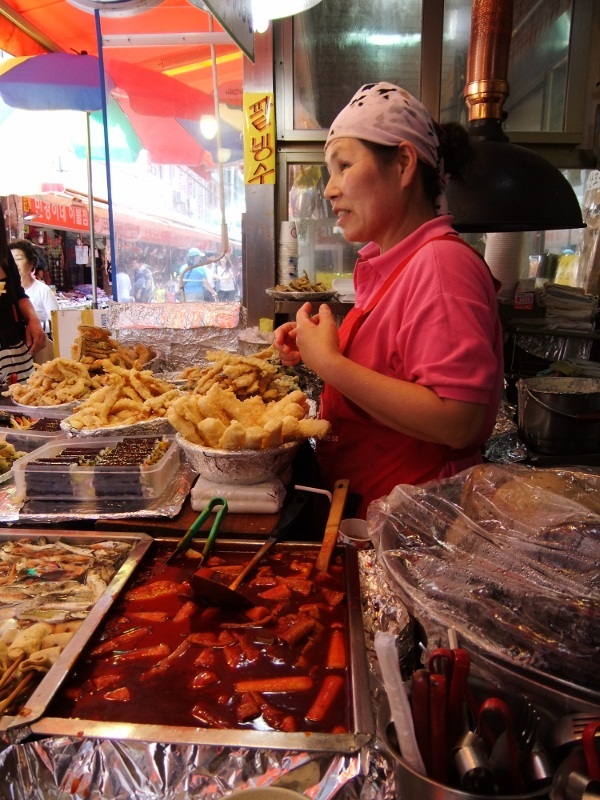 If seafood isn’t your thing, South Korea has you covered too. 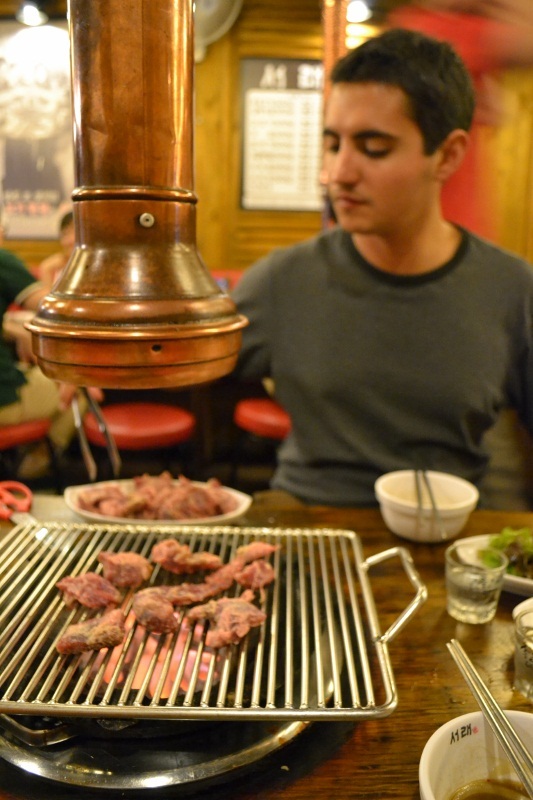 Enter Korean Barbecue. These great restaurants are perfect for dining as a couple or with a group of friends. 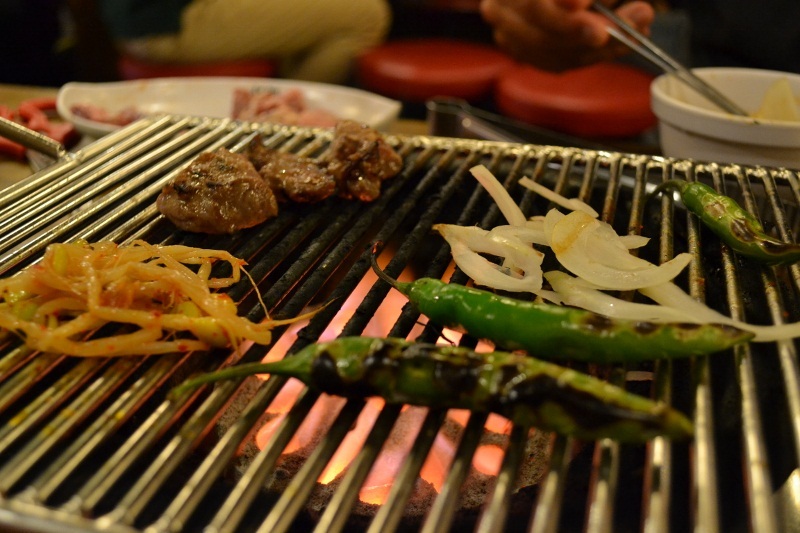 A charcoal pit in the middle of the table allows you to grill up your own meat while you enjoy bottomless side dishes of kimchi and vegetables. Koreans are very methodical eaters. 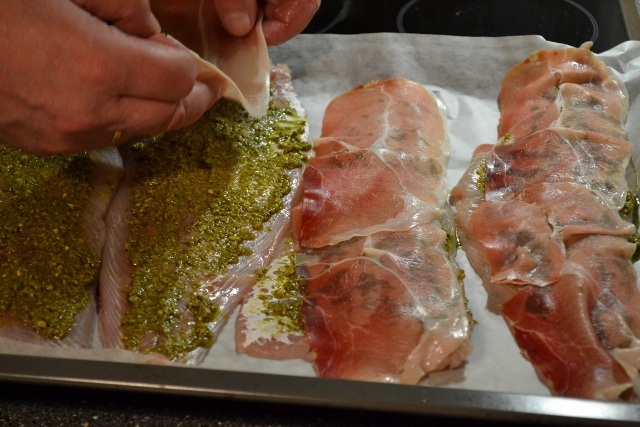 Everything has to be prepared just so, each item paired with its particular garnish. 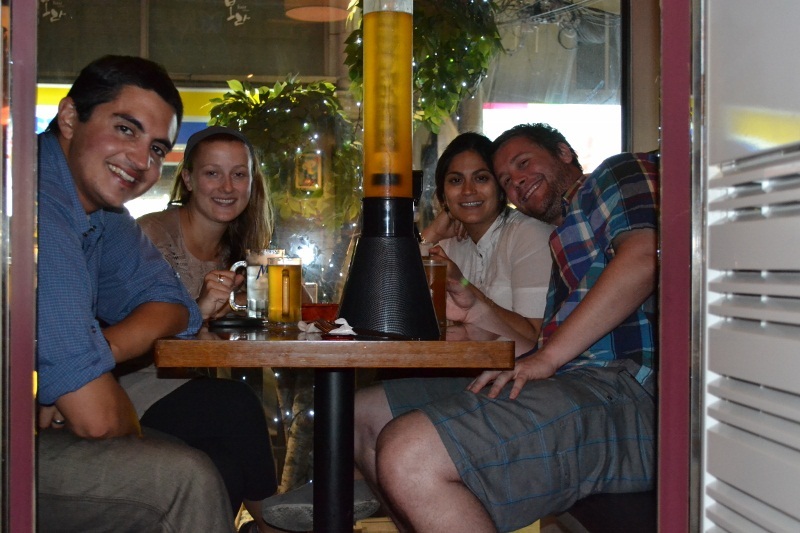 We definitely mixed it up at the Korean BBQ and some people looked at us funny. One couple even stopped us mid-meal, to show us how it was done. Man and grill. Need we say more? 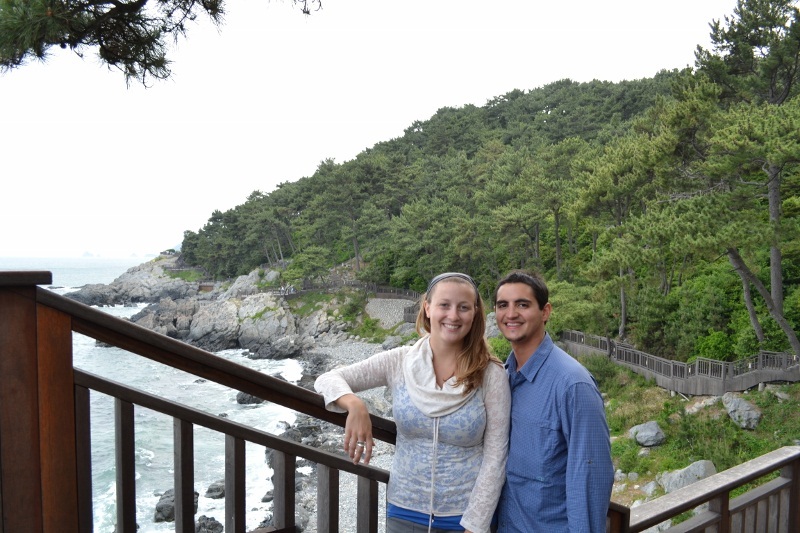 One of our friends from DU is living and teaching English in South Korea, and we had a blast hanging out, getting the inside scoop on the country, and visiting her middle school class (more on that in a future post). Thanks again Danielle for a great time! Enjoying laughs with friends old and new. 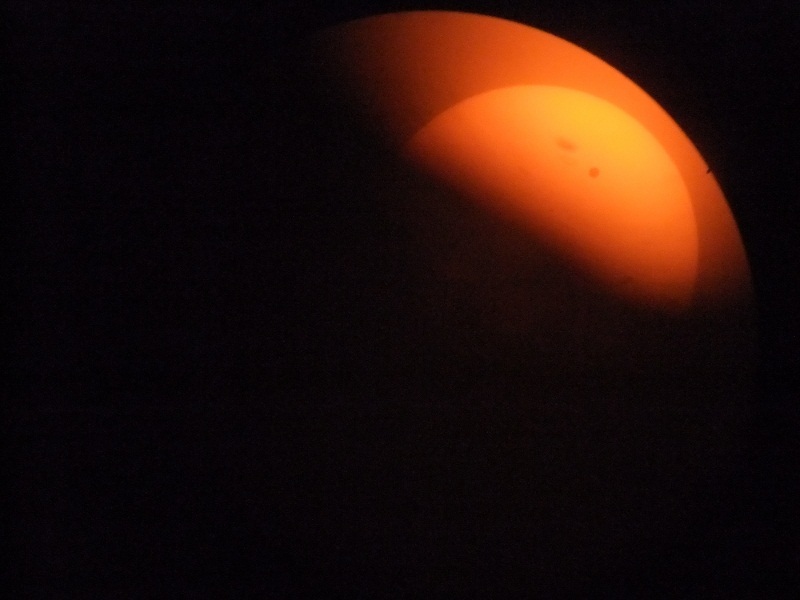 As if a week of maxing on the beach, grubbing tasty Korean food and hanging out with friends wasn’t enough, viewing the Venus Transit across the sun was icing on the cake. The view of this rare astronomical event was said to be the best in this region of the world. Foolishly we tried to look at the sun using only two pairs of sunglasses. Epic fail. 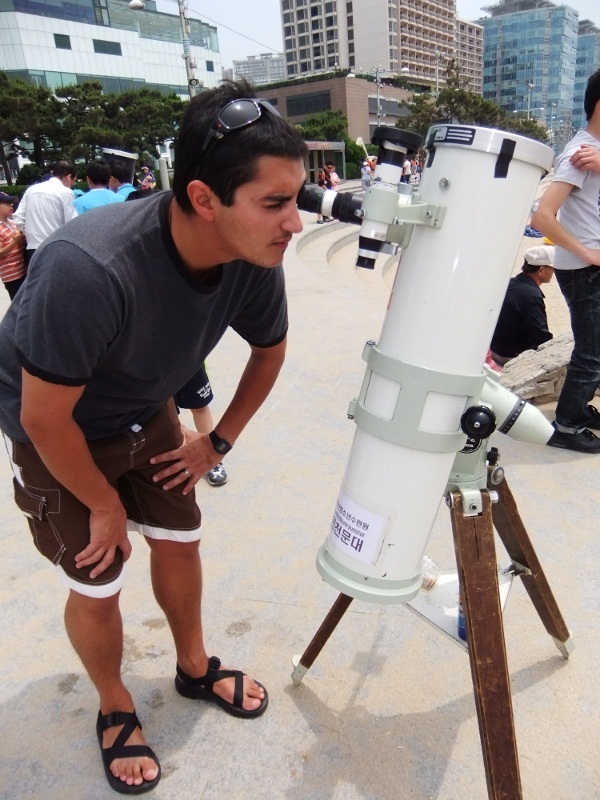 But we were lucky enough to run into a group of local physics students who had telescopes set up on the beach. Win! Mike scoping the awesome view of Venus crossing the sun. Guess we’ll have to wait until 2117 to see it again. 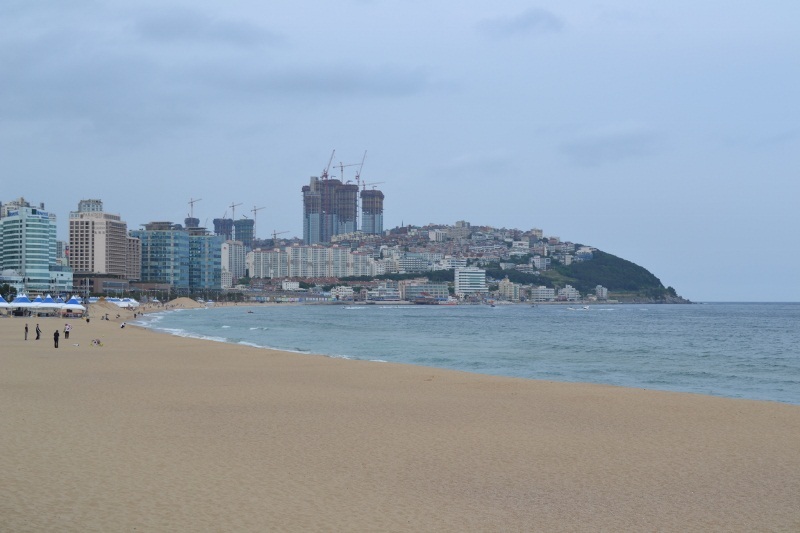 We didn’t have a guidebook when we got to Korea, nor had we done much planning beyond booking a hostel, so we really didn’t know what to expect from Busan. Half the beauty of traveling is making it up as you go, this time things went our way and we couldn’t have picked a better time to be there. So where are we now? We managed to peel ourselves off of the beach in order to fly to Japan today. We’ll spend a few days in Kyoto before heading off to work. You’re eyes are not deceiving you; yes, for the first time in over six months we will be getting paid. We’re heading to Yokahama to work a booth at a stem cell research conference called ISSCR for Amy’s previous employer. It will good to hang up our travel gear for a bit and get back in touch with our professional selves. Not to mention it will be nice to see our bank account increase instead of decrease for a change! 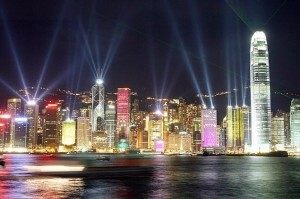 Hong Kong is one of those places that will increase your heart rate within minutes of arriving. It is a bustling city with skyscrapers, neon lights and crowds of people at every turn; it even holds the record for the most densely populated place on earth. One of its neighborhoods, Mongkok, houses more than 130,000 people in one square kilometer! 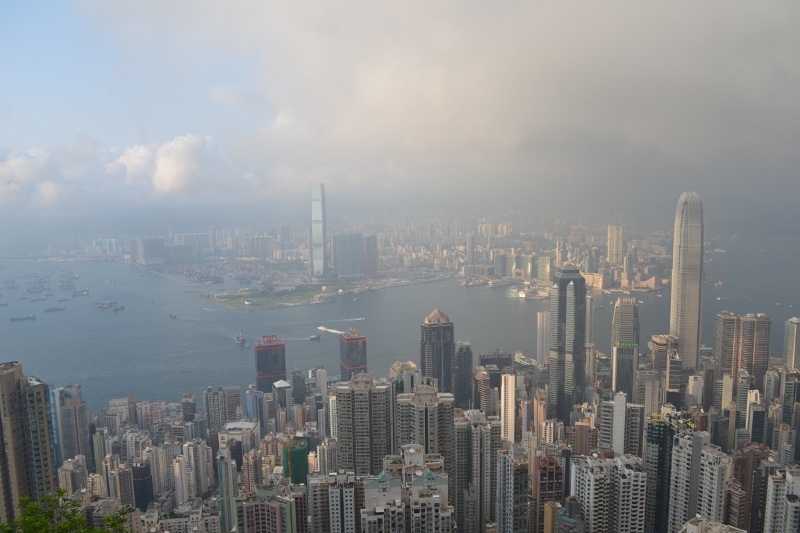 What many people don’t realize is that Hong Kong is more than a city; the region also boasts hundreds of islands and large expanses of sparsely populated coastal jungles. Not only are Hong Kong’s diverse landscapes intriguing, but its socio-political situation also leaves you wanting to learn more. Long held by the British and returned to Chinese control in 1997, the city is still in its infancy as a Special Administrative Region (SAR). Its western style is prevalent, while its Chinese roots are unavoidable. During our week visit, we often found ourselves teetering between two different continents. Although technically part of China, Hong Kong feels like its own small country. It has its own immigration and customs controls, currency and flag. At the moment, only Hong Kong and Macau are designated as SARs in China, but the model is seen as a possible solution for future reunification of contested islands, such as Taiwan. 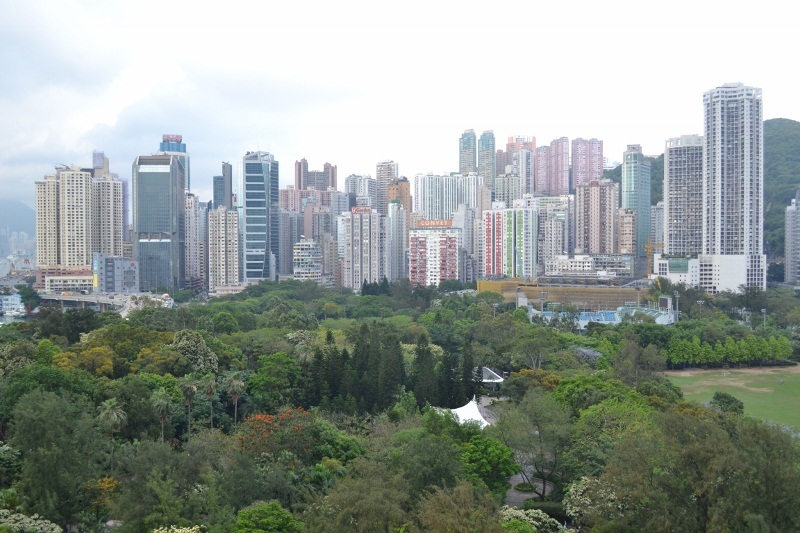 Hong Kong’s mainland neighbor, Shenzhen, provides an interesting parallel to Hong Kong. Shenzhen was China’s first experiment with Special Economic Zones (SEZs), which are pockets of “capitalism,” for lack of a better word, within this Communist country. In just under 60 years, Shenzhen went from a small fishing town to a bustling, skyscraper-laden mega-city of over 10 million in the greater metro area. We stopped in Shenzhen for a few days before entering Hong Kong; it was an interesting place to visit to gain a brief education on how Deng Xiaoping’s policies reformed China and how Shenzhen shaped the future of the nation’s SEZs. 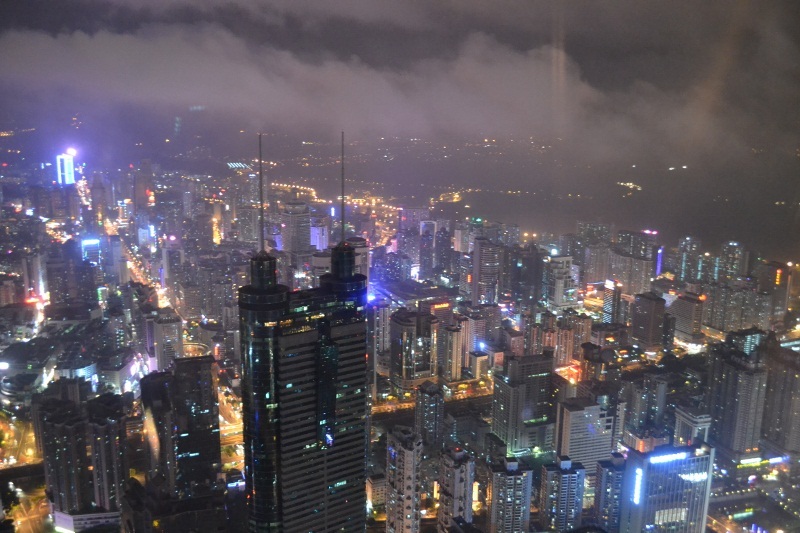 View from the St. Regis Hotel in the Kingkey 100, Shenzhen’s tallest building at 441.8 metres. It is currently the world’s 10th tallest building! Politics aside, Hong Kong is a playground for travelers from all walks of life (although budget backpackers be warned, it is not a cheap destination). Both the cuisine and shopping run the gamut from the finest international establishments to the most budget options around. As long as you can handle the heat and humidity, outdoors enthusiasts could spend weeks in Hong Kong jumping from island to island. Random fact: Hong Kong is composed of 263 islands. We made our home base on Hong Kong Island in the area known as Causeway Bay. Although one of the more expensive hostels we’ve stayed at thus far, the view from our room on the 14th floor could not be beat! The building boarders Victoria Park, one of the largest green spaces on Hong Kong Island, and the views spanned all the way across the harbor to Kowloon, the mainland part of Hong Kong. Looking out on Victoria Park from Parkview Hostel. Since many HongKongese work in Causeway Bay, it is home to some of the best and most affordable local lunch spots in town. You can eat until your stomach is bursting at one of Hong Kong’s famous dim sum restaurants, or choose from a variety places that serve up everything from Cantonese cuisine to hot Szechuan dishes. The prosperity of the city has made it a melting pot for immigrants from all over the world. If there is a particular type of cuisine that you are looking for, it can certainly be found in Hong Kong. 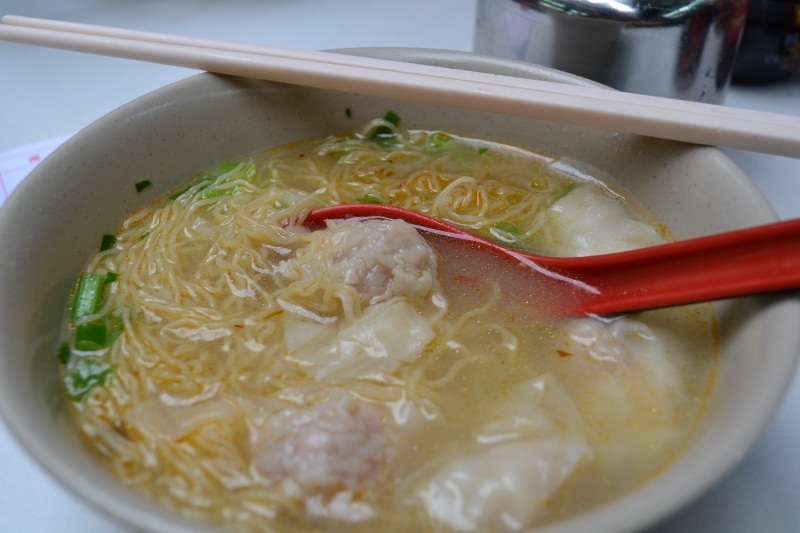 Shrimp wonton noodle soup can be found from most hole-in-the-wall restaurants in Causeway Bay. A tasty and cheap meal for only 20-25HKD. 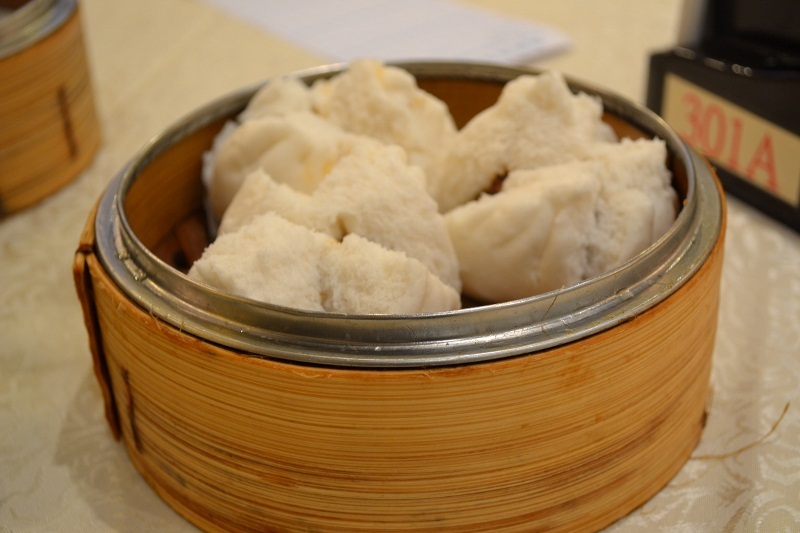 Get our dim sum on with some BBQ pork buns. Before arriving in Hong Kong, one of our friends suggested that we absolutely not miss the Peak Tram. He was spot on with this recommendation. The tram itself feels like riding a roller coaster up the side of a mountain, and once at the top, the views of Hong Kong are incredible. We quickly skipped through the horde of tourists at the top and headed straight towards the network of trails that meander through the hills. The canopy of trees and ferns are not only beautiful, but help to lower the temperature which is a welcomed change from the heat beating down on the concrete jungle below. View from the top of the Peak Tram. It must be breathtaking on a perfectly clear day. We like to think of ourselves as smart and seasoned travelers, but from time to time, we do fall into a tourist trap. Although it pains us to admit it, one such incidence happened in Hong Kong. 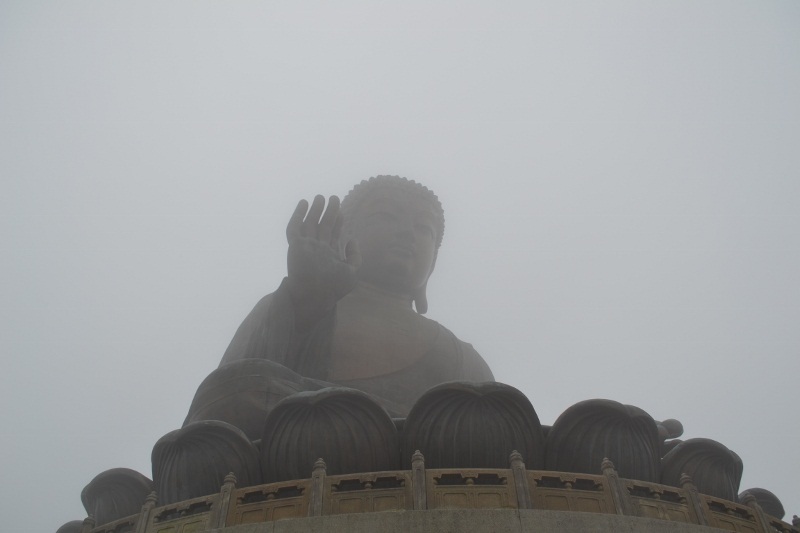 We had heard about a Big Buddha on the island of Lantau, and having not been in Asia for more than a few weeks, it sounded pretty cool. So, we hopped on the metro, and then a bus, and after about two hours, we had arrived. To our disappointment, said “Big Buddha” was situated in the middle of a fake village, all of which had only been built in the 1990s. The town even included a 7-11; Slurpee while you see the Buddha, anyone? To make matters worse, the statue (albeit big) was nearly completely hidden by a thick mist. We will include a photo for you all to see; this way we won’t feel like our trek to Lantau was a complete waste of an afternoon. 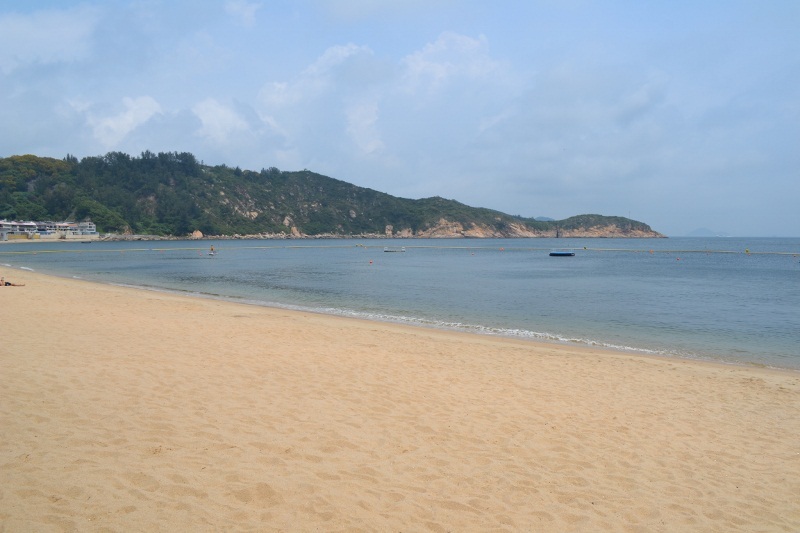 No visit to Hong Kong is complete without a little beach time. After all, how can you visit an archipelago of islands in the South China Sea without getting a little R&R? To get away from the city, we took a ferry to the Island of Cheung Chau. Mainly a fishing harbor, the island also offers some fantastic beaches and hiking. 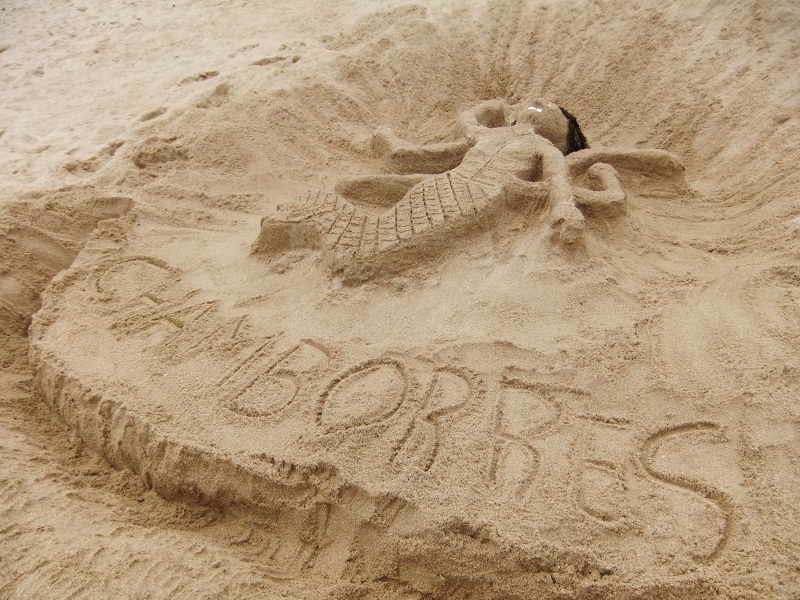 Our time at the beach was, well, time at the beach…plenty of sun, sand, and cold beer. Putting in our time at the beach on Cheung Chau. In the afternoon, we set out for a hike around the exterior of the island. The views were great and the ocean breeze was so refreshing after baking in the sun. 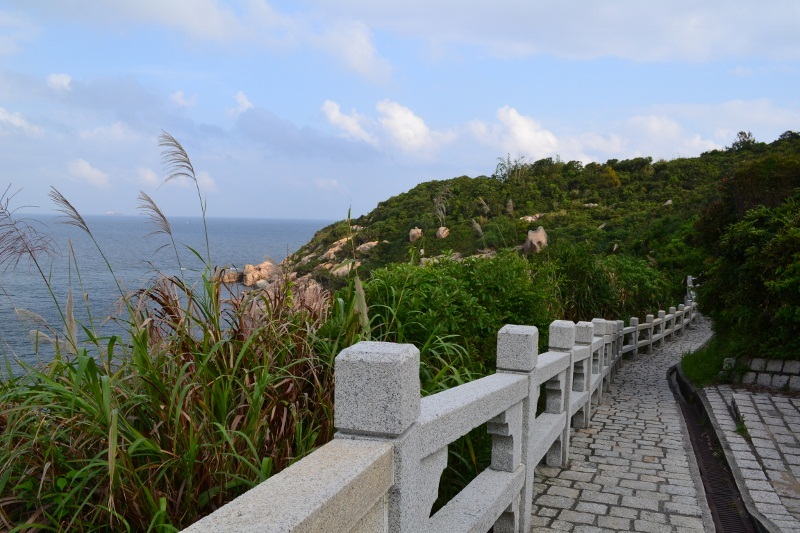 Walking along Cheung Chau’s Mini Great Wall. 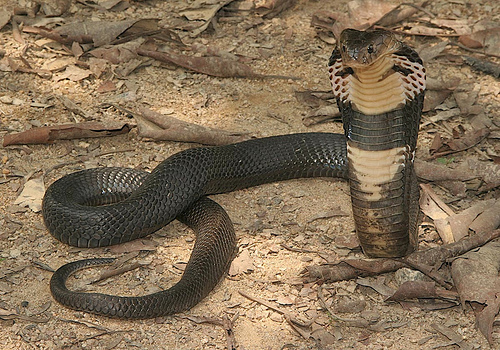 We hadn’t expected too much excitement, just a leisurely hike, but all that changed when found ourselves face to face with a four foot Chinese Cobra. The whole encounter lasted only a few seconds, as the snake made a wise choice and quickly fled up the mountain, but just seeing a snake like that is enough for a hefty shot of adrenaline. Exotic yet familiar, Hong Kong is truly one of those places that you have to see to believe. It has so many moving parts, but somehow everything still seems to gel. If the travel bug inside of you is yearning for the excitement that the Far East offers, but you are a little unsure about taking the plunge, Hong Kong is the place for you. When we woke up the morning after our hectic first night in Dubrovnik, we were ready to turn a new page and enjoy ourselves. View of Dubrovnik’s old town from Fort Lovrijenac. We started off by having lunch at a great vegetarian restaurant in the old town called Nishta. In central and eastern Europe, there is no lack of meat and potatoes, so stumbling upon a creative vegetarian restaurant was very refreshing. 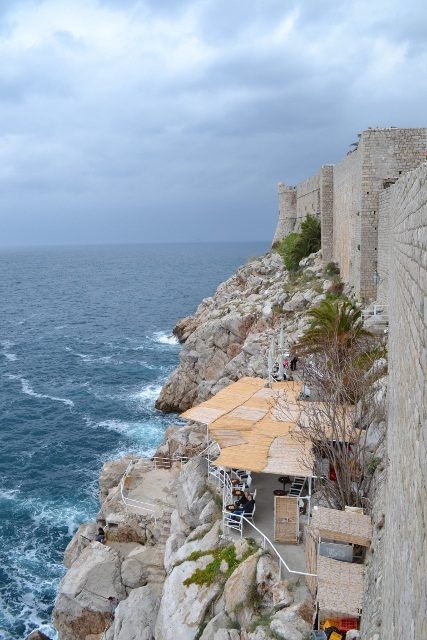 We loved this place so much that we ended up eating there three times during our short stay in Dubrovnik. By the way, we received no compensation for writing this, we just loved it that much. After a satisfying lunch, we were off to explore the town. 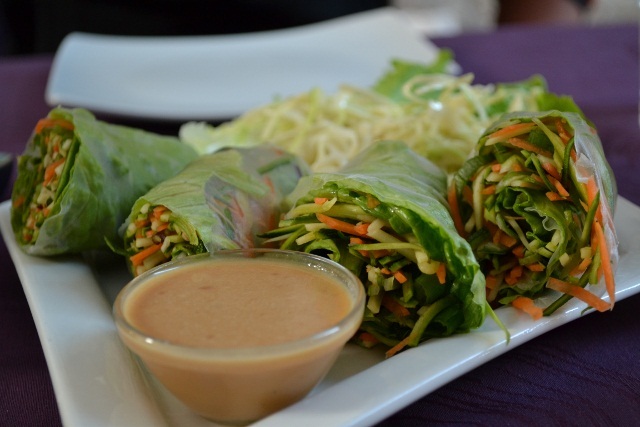 One of the many tasty dishes we enjoyed at Nishta Vegetarian Restaurant. As a UNESCO World Heritage Site and one of the most picturesque old towns in Croatia, Dubrovnik has become a tourist hotspot. Even though we were there in the off-season, the town was still crawling with visitors; not our ideal way to travel, but worth it, considering the sheer magnificence of this place. Even though the wall walk is only 2km, it took us nearly 3 hours! We were stopping constantly to snap photos and enjoy the view. Many European cities that we have visited claim to have amazing castle districts; however, Dubrovnik is truly the definition of a town within a castle. The wall completely encircles the old town, with only four gates with which to enter and exit. The best way to soak up the spectacular views is to take the “wall walk.” Tickets cost 70 KN (about 12 USD) and allow you to walk along the entire exterior wall of the city and visit the nearby fort. 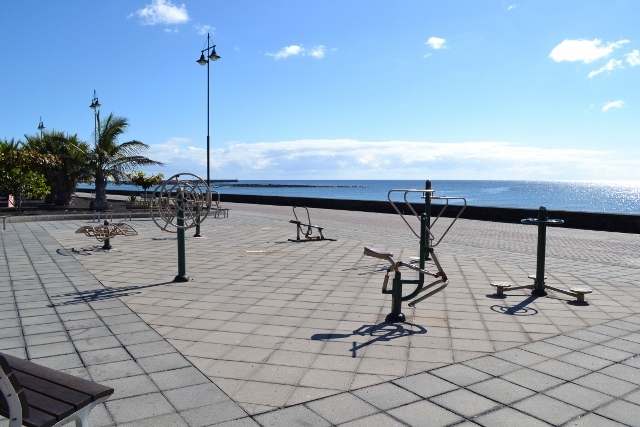 The walk is about 2km long and provides a 360 degree perspective on the city, sea and nearby islands. View from the wall towards Lokrum Island. One of the things that amazed us was the massive amount of stone and man power that went into constructing not only the wall, but all of the streets and buildings located inside of the city wall. Everything is made of stone. 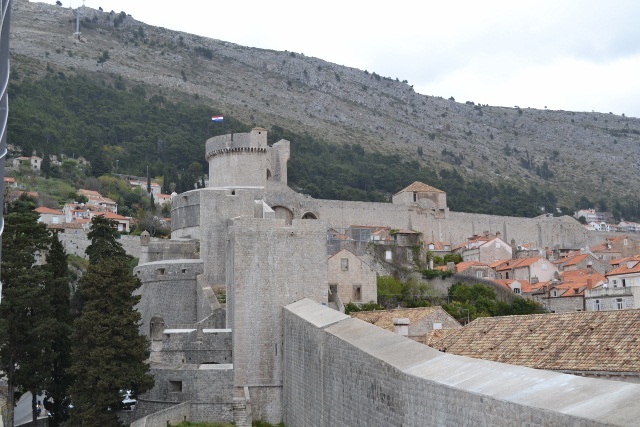 During the 1991-92 Siege of Dubrovnik, the castle walls proved to be more resistant against modern weaponry than newly constructed buildings. Another feature to note is that most of the city’s buildings are situated on steep hills, so exploring the town is quite literally breathtaking. After our first day we were exhausted, so we headed back to our hostel for a home cooked meal. The kitchen was located on the ground floor, and we couldn’t help but chuckle as we heard other tourists panting and gasping “I need a break” as they walked by our door. The end of the 60+ stairs leading up to our guesthouse. 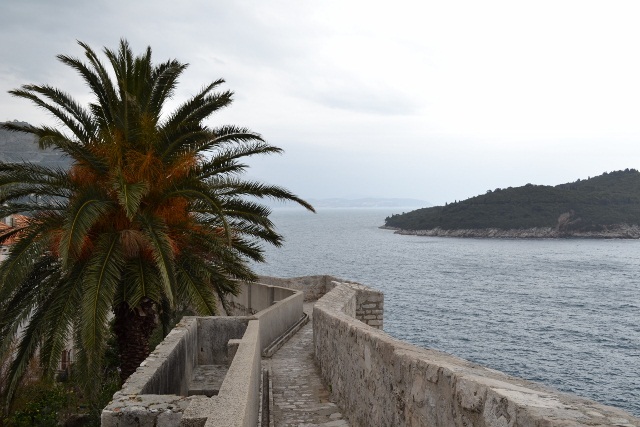 On one of our days in Dubrovnik, we decided to take a ferry to the nearby island of Lokrum. Being only a 15 minute ride makes Lokrum easily accessible as a half-day or full-day trip from Dubrovnik. Heading out for a day of hiking on Lokrum Island. Lokrum is a great place to take in views of Dubrovnik and sunbathe as well if the weather is right. We brought lunch with us and hiked around the edge of the island to find the perfect picnic spot. 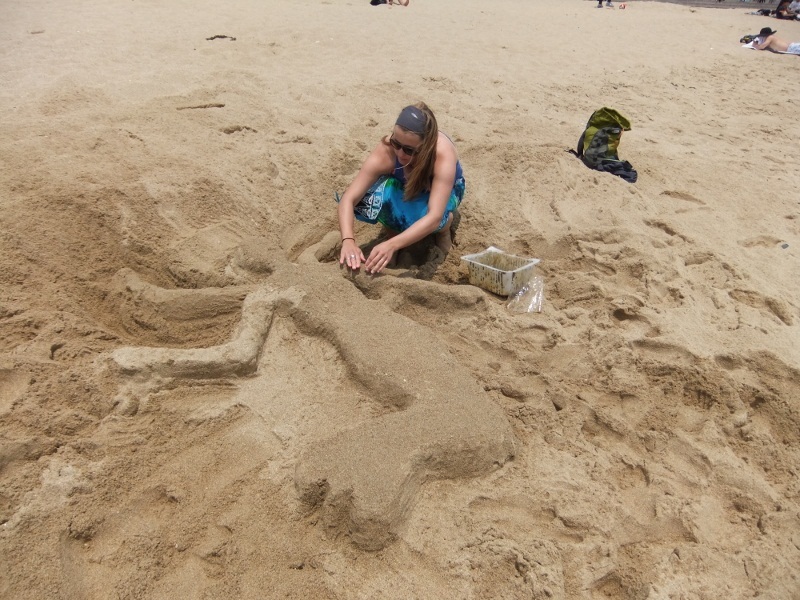 This proved a little more difficult than we had imagined due to the infestation of peacocks on the island. 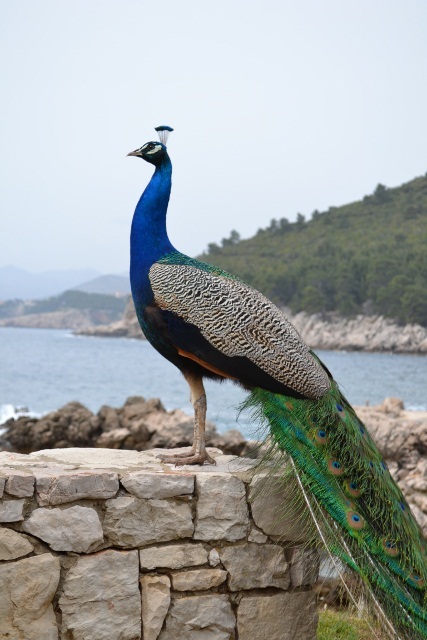 Peacocks were introduced from the Canary Islands and the population has since spread out of control. These birds will not leave you alone once they figure out that you have food in your pack. They look beautiful, but they are really just over-sized pigeons. It rained on and off on our last day; for Amy, as a native Oregonian, rain is always a welcome sound and smell. In between the clouds, we stopped for a glass of bubbly at a bar that is situated on the rocks which form part of the castle wall. 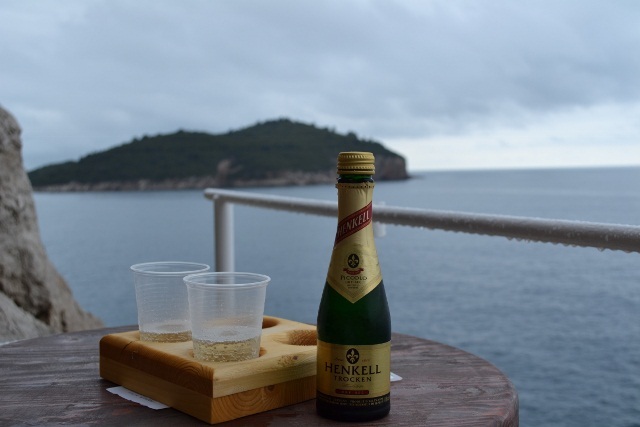 Definitely a splurge from our usual backpacker budget, but champagne always tastes better with a view. The view that justified the cost. The only sign we could find for this place read “Cold Drinks” – we think that name sums it up pretty well. 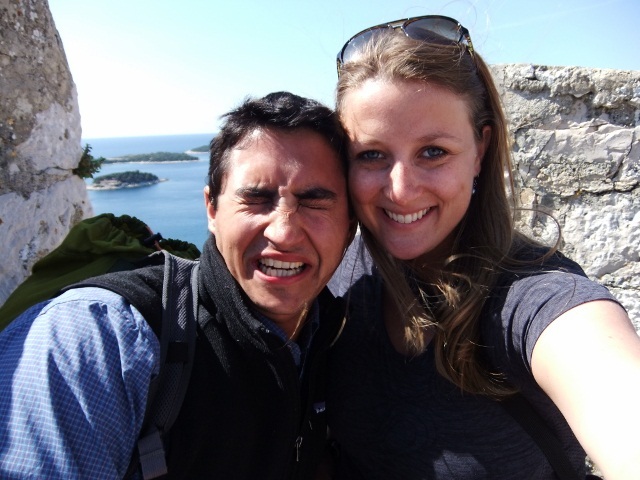 Excluding our hostel mishap that we shared in Part II of this series, we absolutely loved the Dalmatian Coast. While Croatia has been growing in popularity among tourists in recent years, it still seems to be somewhat under the radar, but surely won’t be for long. The islands, beaches and cliffs that make up the Dalmatian Coast are a sight to see, and the Croatian people are so welcoming that you immediately feel at home in their country. We will definitely be back. 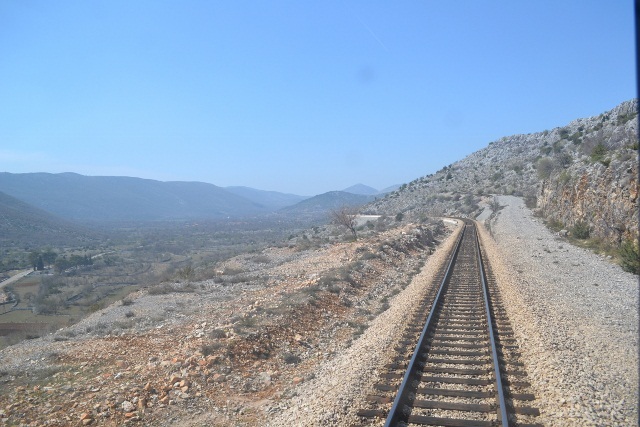 Our journey to southern Croatia’s Dalmatian Coast was done in a very “fly-by-the-seat-of-your-pants” kind of way; all of our train tickets were purchased at the station within an hour of departure. Traveling this way brings a sense of excitement and anticipation that is difficult to find in today’s internet-centric world where planning a trip can be done with just a few clicks of a button. In the past few weeks, we have been using trains as our primary mode of transportation which allows us to see much more of the landscape than traveling by plane. For both of us, trains are our favorite way to travel. They are not always the fastest way to get around, and you often have to make connections and switch trains, but the experience is so much more laid-back than flying. The scenery along the train ride from Zagreb to Split included everything from snow-capped mountains to vineyards to lakes. The trip from Eger, Hungary to Split, Croatia took us two days via three different trains, totaling about 14 hours on the rails when all was said and done. Our “layover” in Zagreb, the capital of Croatia, was a nice surprise. The city was much more full of life than we had anticipated, with tons of young people out and about enjoying the parks, cafes and restaurants that line the cobbled streets. It’s a bit of a miracle that we made it to Split at all. Half way through our train ride we noticed that we had been stopped on the tracks for quite a while. Wondering what was going on, we poked our heads out of the window and noticed that the train was being decoupled; the front half was pulling away, while our car was left standing on the tracks. The train conductor didn’t speak English, so we just went with it and hoped that we were on the right car. Another engine arrived a few minutes later, and we were on our way again. Upon arriving at the Hungary-Croatia boarder a few hours later, our passports were checked and stamped. Our concern about being on the right train was raised again when we looked down at our passports and saw “Republika Hrvatska.” Hrvatska?! We thought we were going to Croatia. Turns out Hrvatska is Croatia. English versions of cities and countries are often different (i.e. Sevilla>Seville. Lisboa>Lisbon. ), but how did someone come up with Croatia from Hrvatska? Anyway, we digress. We did eventually arrive in Split, and when we did, we felt very glad to be back in a city on the sea. Our last view of the ocean was in Denmark, and although only a month ago, it felt like ages. Being from Colorado, Mike had always said that he prefers the mountains to the sea, but it seems that each time we travel to the coast it is harder for him to leave. 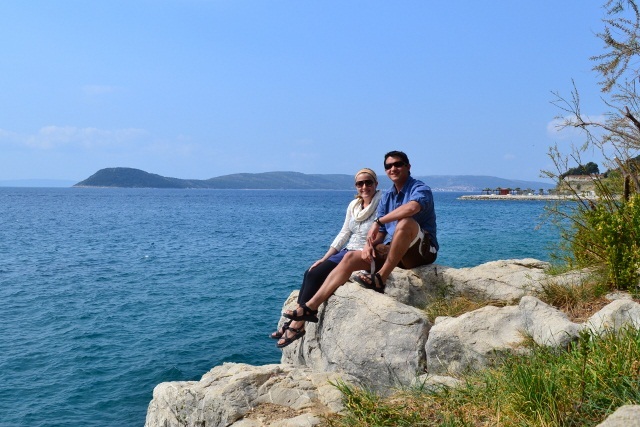 Relaxing along the rocky Dalmatian Coast. Split is the second largest city in Croatia, yet only recently has become a popular tourist destination. It serves as the transportation hub for the numerous islands that speckle the Dalmatian Coast. It is also known for Diocletian’s Palace, the ancient Roman palace that encircles in the old town, and for its numerous beaches and party atmosphere. 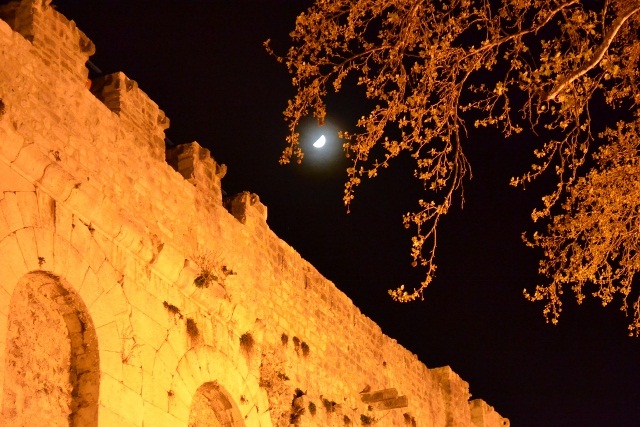 An exterior wall of the Diocletian’s Palace under the moonlight. 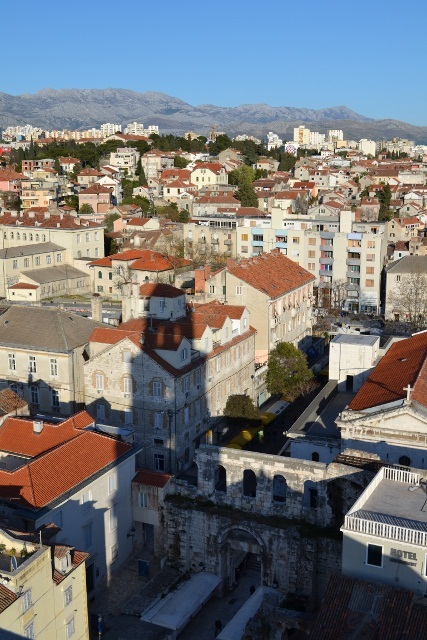 View of Split from the top of the bell tower. The cafe culture along Split’s main pedestrian street is also prevalent. On our first day there, Amy said “is it just me, or is everyone staring at us?” We quickly learned that people watching is THE thing to do in Croatia. Everyone looks at everyone else, and most people can be seen decked out in big sunglasses to aid in the sport of people watching. 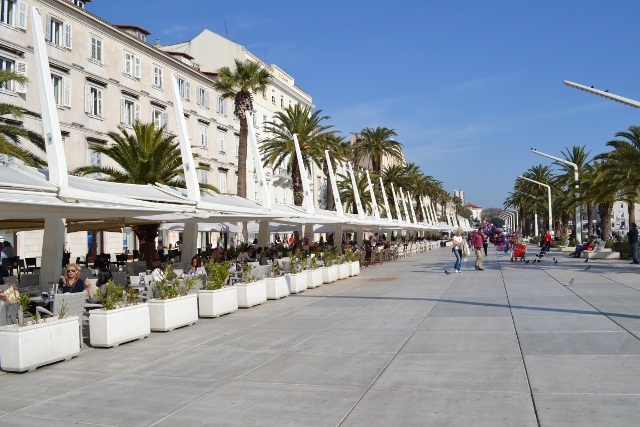 The Split Riva, or sea promenade, is lined by outdoor cafes and restaurants. 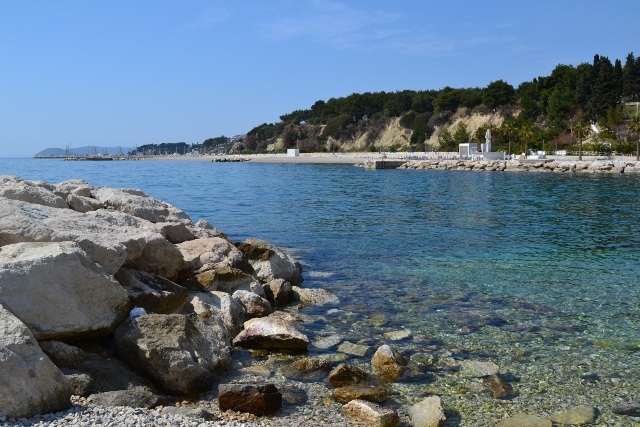 We had originally intended on staying three nights in Split, but after a day, we decided that would not be enough, so we extended our visit for another two nights. The weather gods blessed us with warm temperatures and cloudless skies, making ideal conditions for a few days at the beach. 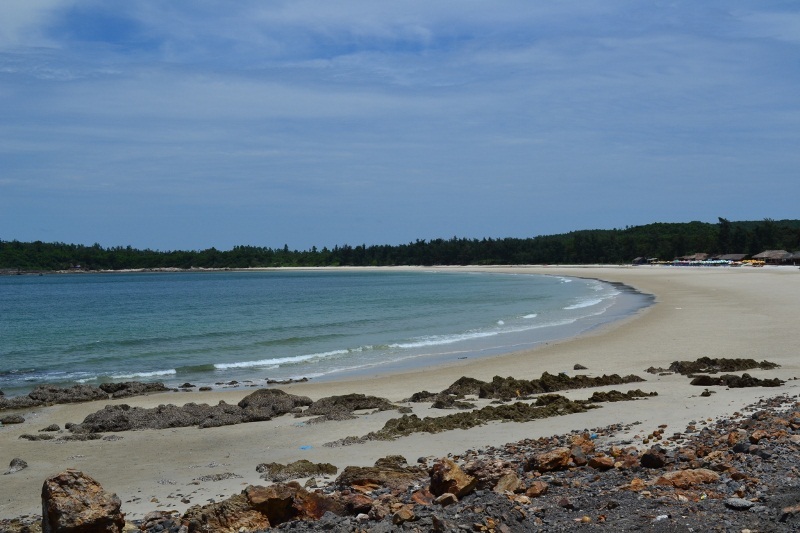 Crystal clear water along Znjan beach. 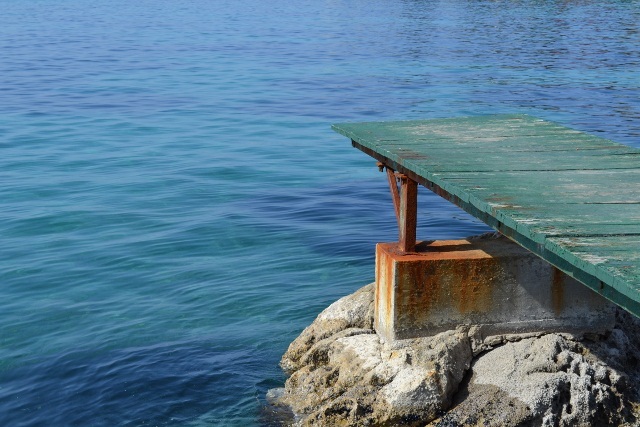 Diving board along the popular Bačvice beach. 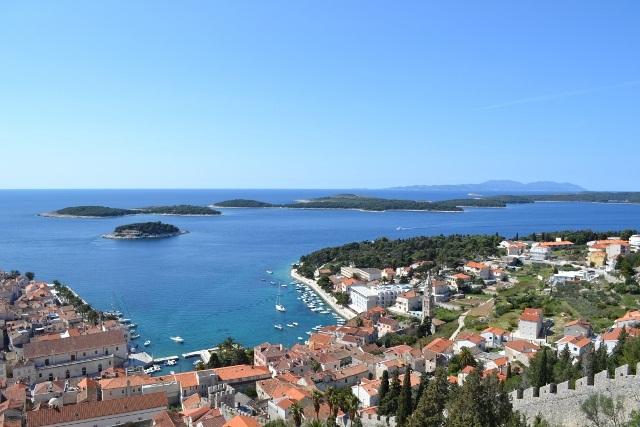 The most famous island along the Dalmatian Coast is Hvar. The ferry from Split to Hvar takes about two hours and the scenery is gorgeous. The boat ride alone justifies the cost of the ticket, but the stunning natural beauty of Hvar is the real gem. We spent our day on Hvar hiking up to the castle for an amazing view, strolling along the coast and swimming in the turquoise sea. Then, we soaked up some sun while dining in the plaza. It was one of the most relaxing and enjoyable days of our journey thus far. It literally felt like heaven. View of Hvar harbor and the Pakleni Islands from the castle. Have you ever seen such a perfect mid-sneeze photo? We were laughing for days over this one. 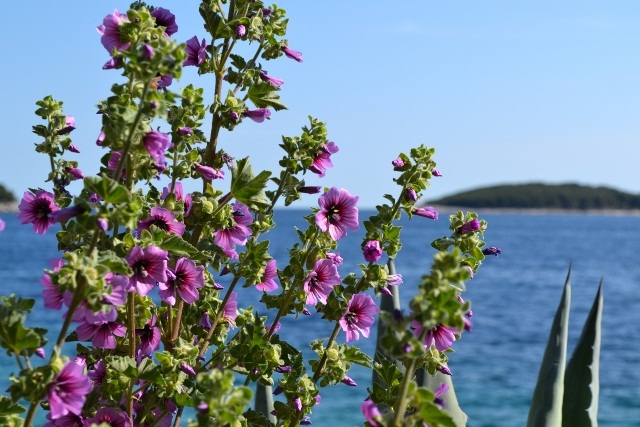 Flowers were blooming all over Hvar Island. It must be spring. Maybe it was the great weather that put everyone in a good mood, but whatever the case, we encountered only friendly people on the island. Everyone we met, tourists and locals alike, had a huge smile on their face. Among those we met was a really fun couple that we kept running into throughout the day. 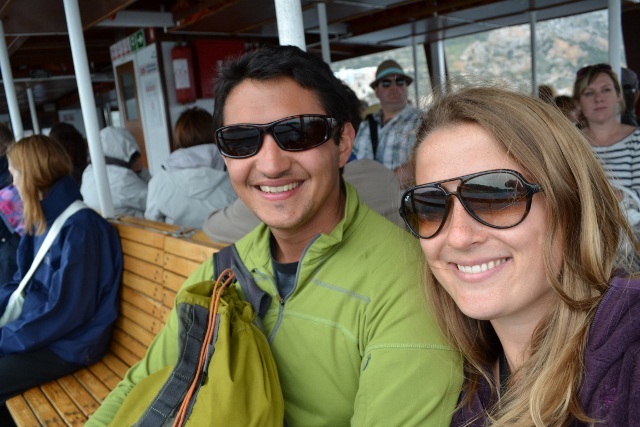 We spent the entire ferry ride back to Split chatting it up with our new friends, Juan and Saskia. Originally from Zimbabwe, they now live in Australia and are currently wrapping up a 9-month road trip around Europe. Dinner that night turned into ten hours of stories and jokes. While being away from friends and family back home can be hard, one of the best parts of our expedition is meeting total strangers along the way and witnessing first-hand how a love of travel brings people together. 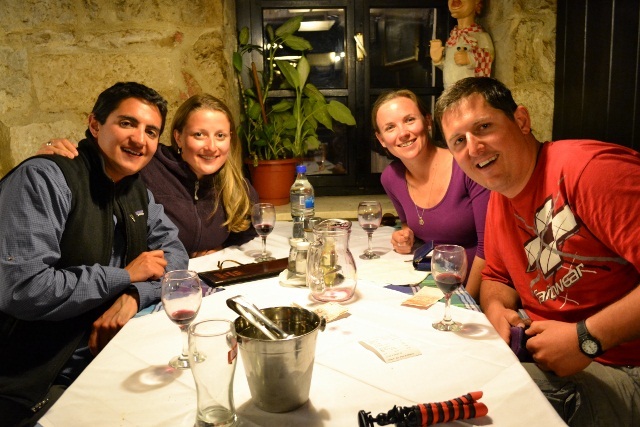 The crew after a delicious Croatian meal. 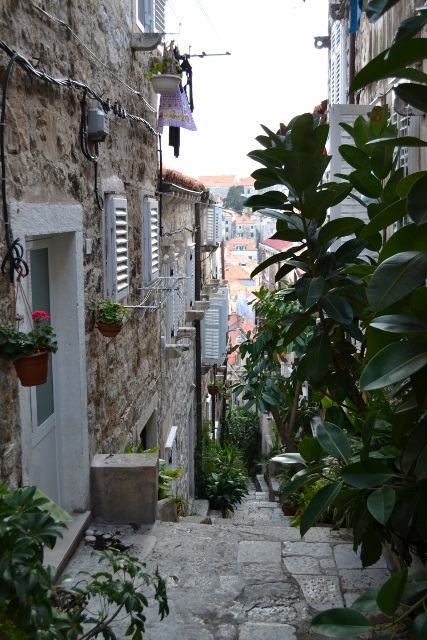 We had to leave the next morning for Dubrovnik, so once we returned to our apartment at 4:00am, we hopped on the internet and booked the first affordable place that we could find. Remember what we said at the beginning of this post about a few clicks of a button? BIG MISTAKE. 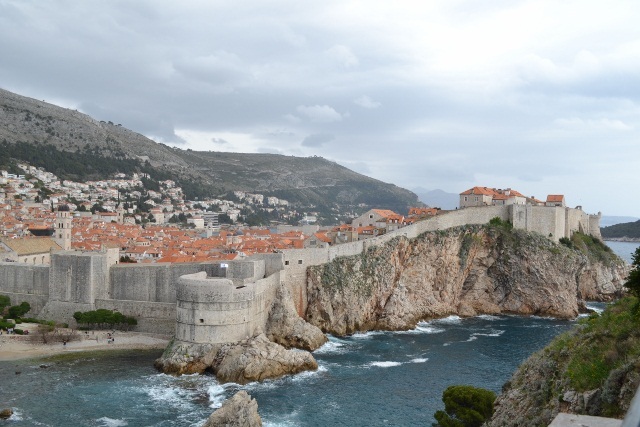 But more to come on that story in our next post…stay tuned for Dalmatian Coast: Part II. You must be wondering, what is hjem? Maybe a typo? An obscure town in Russia? It actually is the Danish word for home. We flew into Copenhagen on the 28th of February to spend a week with the host family that Amy lived with while studying abroad in Denmark in 2006. Returning to Denmark felt like a homecoming, thus the name of this post. It was such a treat to spend time with Lene, Nils, Mathilde, Daniel, Martin, Sabrina and Mikkel! 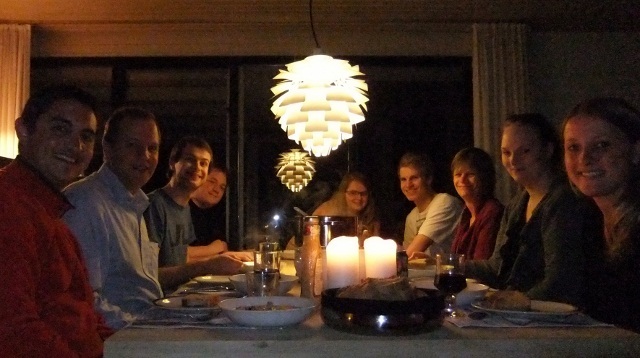 We enjoyed delicious meals each night with great conversations and lots of hygge. Hygge is a Danish word that is difficult to translate into English because it describes a feeling and atmosphere, not a place or thing. Cozy is the closest synonym, however does not do it justice. 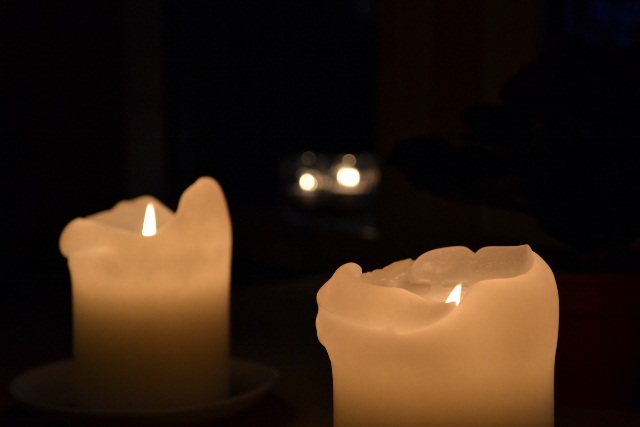 When relaxing in a Danish home, surrounded by candlelight, enjoying good company and often food and drinks as well, you get hygge. Having spent five months living in Denmark, Amy had already seen many of the must sees, but one that had not yet been checked off the list was the Changing of the Guard at Amalienborg Palace in København (Copenhagen). We had not intended on going to see this event, but as we were driving through the city one day, Amy’s host brother, Martin, noticed the time and suggested that we stop to check it out. It was a lot of fun to watch especially since we were able to get the inside scoop from Martin, who served in the Danish Royal Guard himself. Click here to watch a video of all the action. 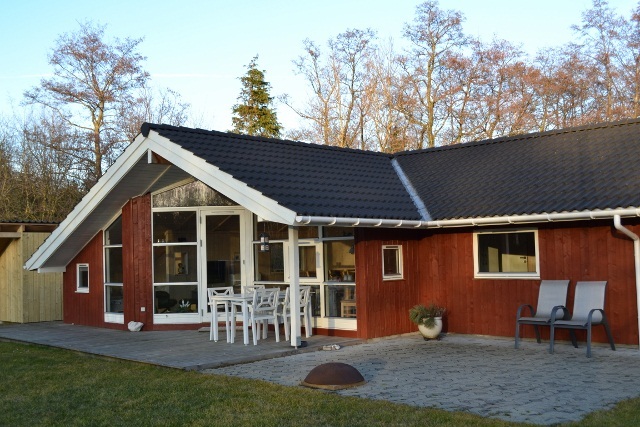 Over the weekend, Lene & Nils, Amy’s host parents, drove us to their summerhouse in northwest Sjælland. It was fun to see the completed house as it was under construction when Amy was living in Denmark. 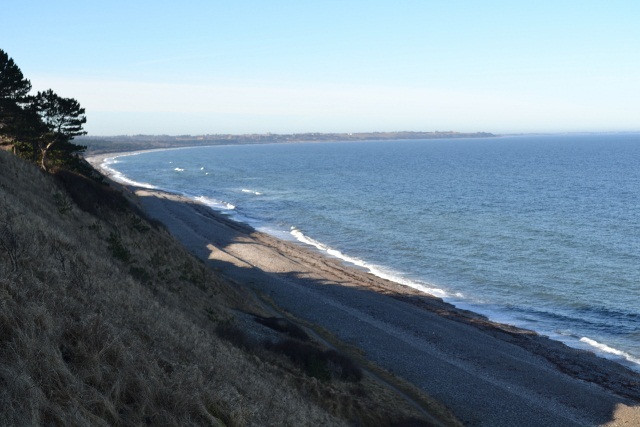 We spent our days Sjӕllands Odde exploring the scenic drives, beaches, viewpoints, and historic sites of the area, which we definitely recommend as a side trip if you plan on visiting København. We learned about some very peculiar ancient burial mounds spread out all over the landscape. 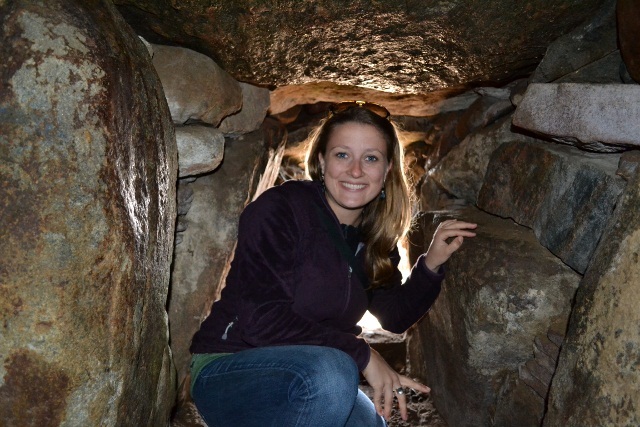 They date back to the Stone Age, and we visited a well preserved site built circa 3500 B.C. At over 5,000 years old that definitely makes it the oldest building either of us has ever entered. In the evenings we retreated back to the summerhouse for some delicious home-cooked meals and hygge time with the neighbors, Leif and Annika. 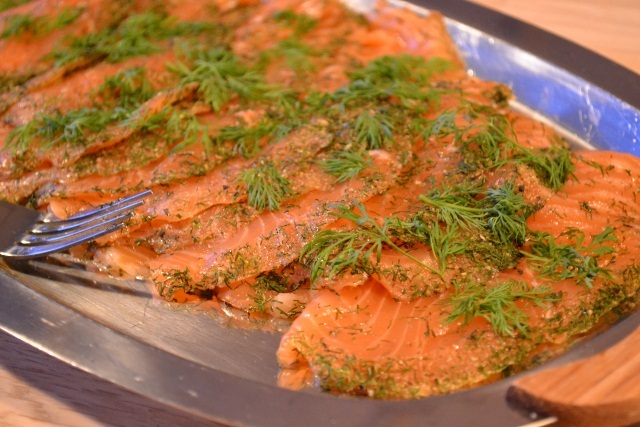 Starter of fresh salmon season with dill. Yum! After returning from the summerhouse, we took a day trip to see Møns Klint and visit Lene’s mom on the island of Lolland. 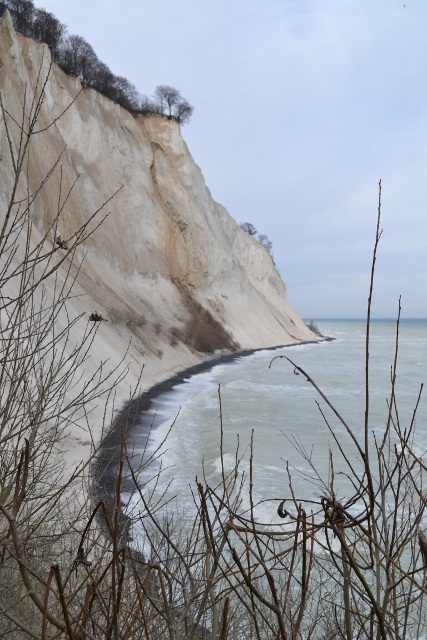 Møns Klint is a series of steep, sharp cliffs on the east coast of the Danish island called Møn, another place you should see if visiting Denmark. Descending nearly 500 stairs from the top to the beach below provides a stunning view of these chalk-white cliffs. 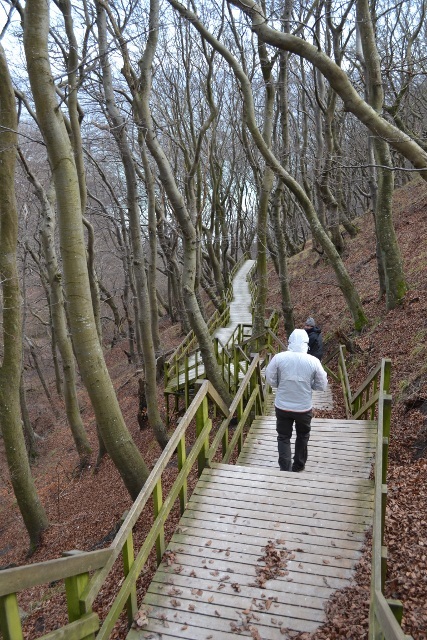 Stairs leading down to the beach of Møns Klint. Easier going down than back up again. After driving from Møn to Lolland, we ended the day at the farm where Lene grew up. All week we had heard stories about “whiskey time,” so were much anticipating arriving to the farm so that we could experience it firsthand. Lene’s parents created this tradition of serving whiskey each day at 4pm to any friend, family member or neighbor who made it to their home in time. We really enjoyed whiskey time and think it is a fantastic tradition to bring people together for the simple purpose of savoring life after a day’s work. 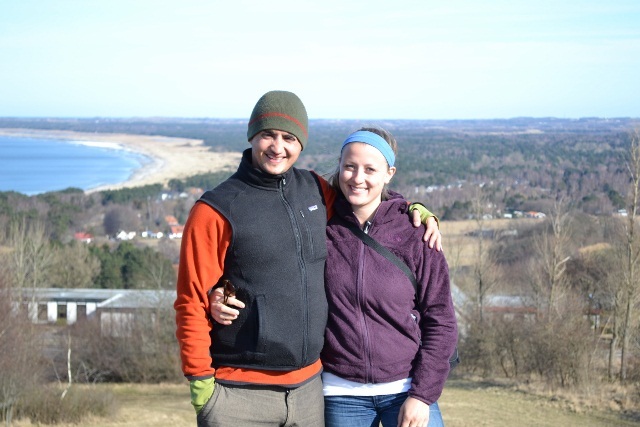 It was more difficult to leave Denmark than the previous countries we have visited because we weren’t only leaving a country we love, but people we love. However, we will certainly be coming back to Denmark time and time again in the future, so instead of saying goodbye, we just said vi ses, which translates to “see you later” in Danish. Lagos was a pleasant surprise. 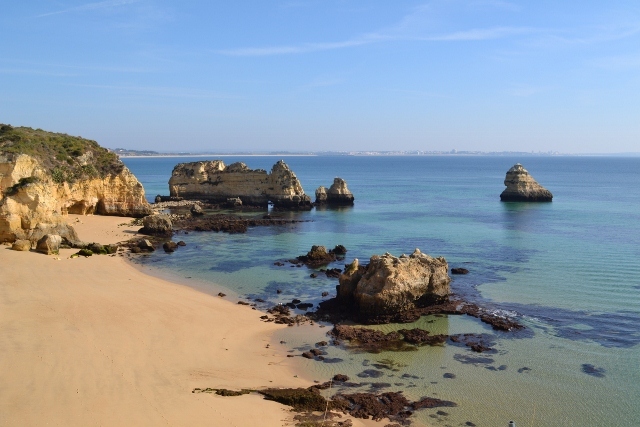 There is no train service between Sevilla and Portugal and a direct bus ride to Lisboa or Porto is quite long, so we decided to enter the country via its southern region, known as the Algarve. 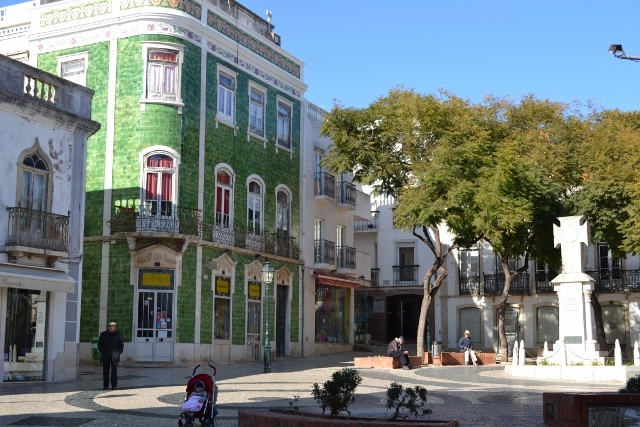 Our first stop in Portugal was the small town of Lagos. Initially, we intended on staying only one night as a way to break up the long trip. Just minutes after arriving in Lagos and walking through its peaceful cobbled streets, we knew that we needed to stay longer, so we did. 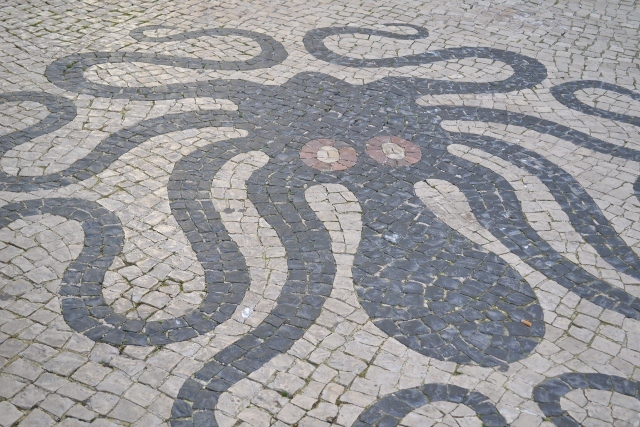 Octopus made of black, white and red cobbles in Lagos. We have found this style of cobble art to be typical of Portuguese sidewalks and pedestrian streets. 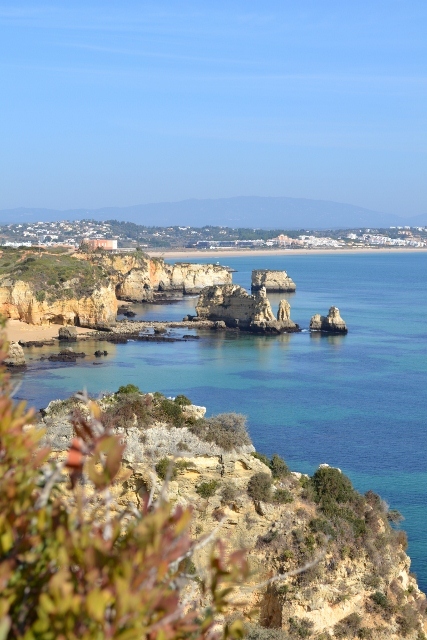 Being situated at the most southwestern corner of Portugal, Lagos is home to some of the most beautiful beaches and stunning seaside cliffs we’ve ever seen. 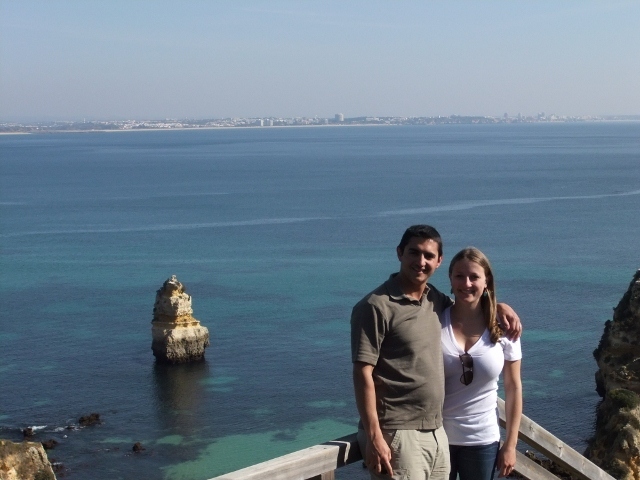 We spent our entire first day walking the trail from the city center to the Ponta da Piedade, a panoramic viewpoint at the west end of town. 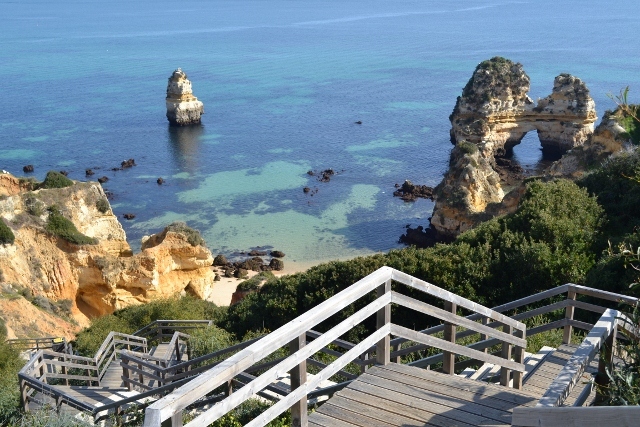 We strolled up and down the many staircases, which lead from the cliff tops to the sandy beaches below. After arriving, we learned that Lagos was recently featured in the #1 spot on TripAdvisor’s list of “15 destinations on the rise” and we could not agree more. From walking around the town, we could tell that the vibe in the high season is likely much different as there are a number of highly visible clubs and bars throughout the town. We, however, really enjoy the peace and quiet that comes with traveling during the off season. Each local we spoke with was welcoming, friendly and eager to talk. The truth is that we wish we had more time to spend in Lagos, but the road was calling and we had to keep on moving north to check out the more well know cities of Porto and Lisboa. 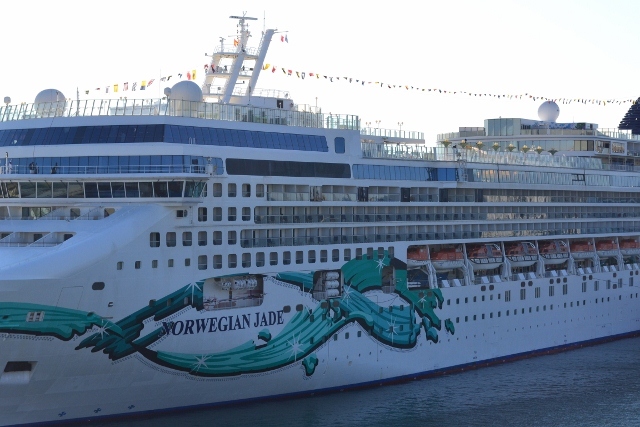 The past nine days of our RTW trip were spent cruising on the Norwegian Jade. We know that cruising isn’t exactly the first thing that comes to mind when you think of budget backpacking, but while researching destinations in Spain during the planning phase of our adventure, we came across an incredible deal on this cruise. The Canary Islands were of particular interest, not only for their relative obscurity and year round temperate weather, but also because much of Mike’s family lineage prior to arrival in the Americas comes from this small group of islands. We set sail from Barcelona just after sunset on Sunday, January 22 and headed out to sea for two days before making our first port. It was a real treat to sail through the Straight of Gibraltar and catch our first glimpse of Africa, lit up on the midnight horizon. 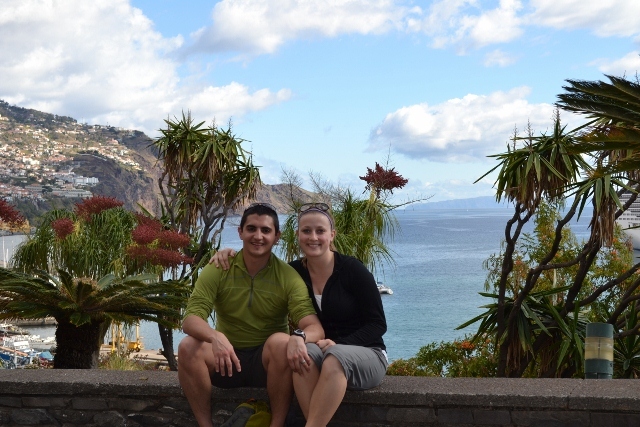 Our first stop was in Funchal, the capital city of Portugal’s Madeira Islands. Despite being located in the North Atlantic, the island felt very tropical with an amazing variety of flowers and birds. We caught city bus #21 first thing in the morning which took us up a narrow and curvy (to say the least) road leading to the mountain top village of Monte. 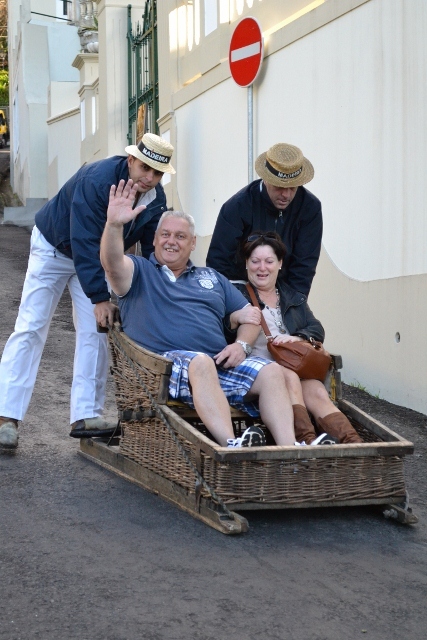 From here, the famous Funchal toboggan drivers set up shop. The toboggan rides, which originated as a way to rapidly transport ice to the shore from the mountain top ice houses, have turned into a major tourist skeptical. While we did not indulge in a ride, we had a blast watching shrieking passengers skid down the mountainside. While most tourists take the toboggans down, we took the scenic walking route, which allowed for some incredible views of the Atlantic with Funchal in the foreground. 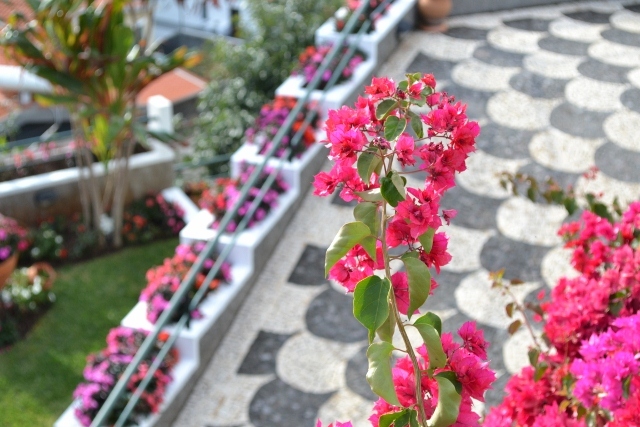 If you’re interested in the particular route that we took, Google search “walking monte to funchal” and you’ll find step by step directions. The steep scenic route did a number on our legs but also allowed us to check out the local architecture. We were inspired by the walled courtyards with beautiful tile work, all perfectly framed by pink and orange tropical flowers. By the time we reached the city center, we were ready to relax. 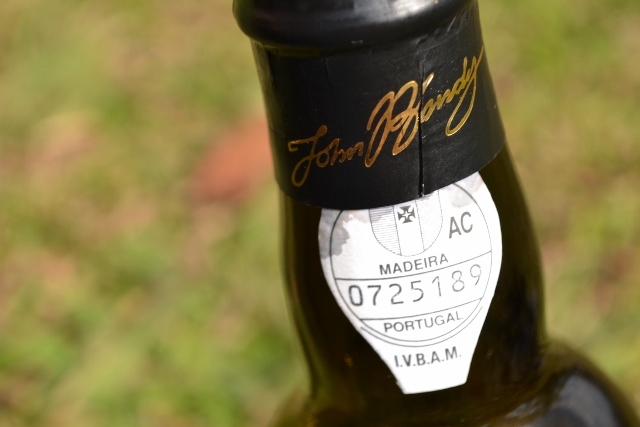 The islands of Madeira are known for producing their own variety of Port wine, so naturally, we had to try some. We picked up a bottle and headed for a nearby park to enjoy our last few hours in this island paradise. 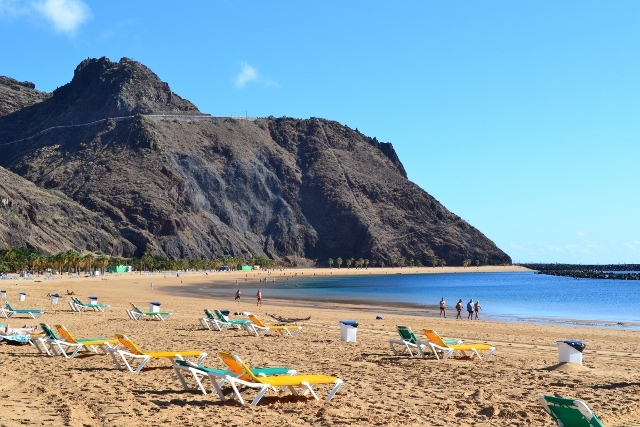 On our second day at port we were blessed with particularly great weather, so headed for one of Tenerife’s few sandy beaches, La Playa de Las Teresitas. We heard that the beach was only a 20 minute bus ride from town and ambitiously attempted to walk instead. While walking, we discovered the Canary’s ubiquitous outdoor public gyms, but after over an hour, the sidewalk became an onramp to the interstate, and we were forced to take the bus. When we finally made it to la playa, we were stoked to say the least! We think the picture says it all. 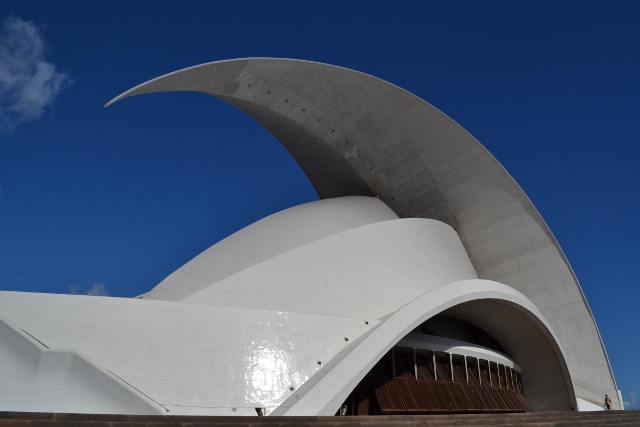 After Amy’s pale skin couldn’t handle the sun any longer, we hoped the bus back to the city center to check out the city’s music hall, El Auditorio de Tenerife. 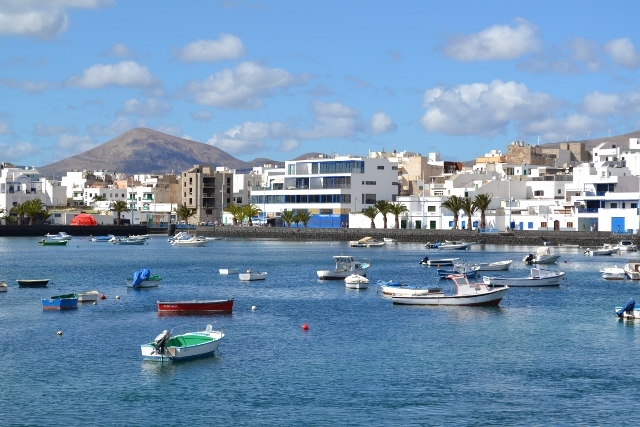 The island of Lanzarote is best known for its picturesque and rugged volcanic landscapes, but we were drained of energy from our previous day in the sun and chose to stay in the small town of Arrecife. While this city is noticeably smaller and less energetic than our first two ports of call, we did enjoy its captivating blue waters and small fishing town feel. Our final stop on the way back to Barcelona was the port city of Málaga, situated on Spain’s southern coast near Granada. 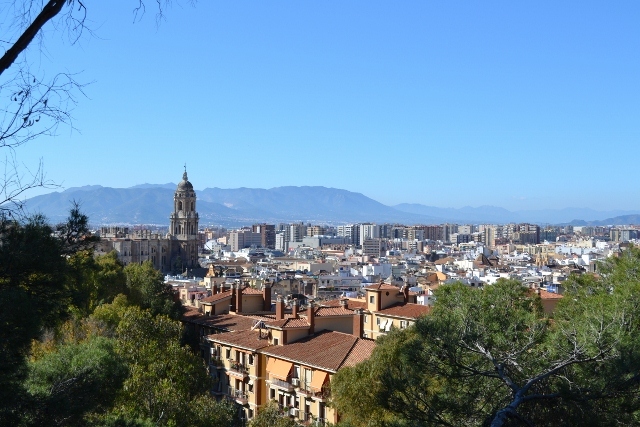 Prior to our arrival, we knew very little about Málaga, but were pleasantly surprised. The city is very modern and well kept, but is still host to some amazing ancient structures. To get a better view, we headed to an old roman theater known as el Alcazaba and hiked up a fantastic nearby trail. From the top we were able to view many of the city’s main attractions including the Plaza de Toros and Catedral del Obispo. Most of our days at sea were spent relaxing by the pool, reading, playing cards, and enjoying the Jade’s fantastic live music and entertainment. Because of Mike’s background in the hospitality industry, we were both interested in the operational aspects of running a floating hotel. 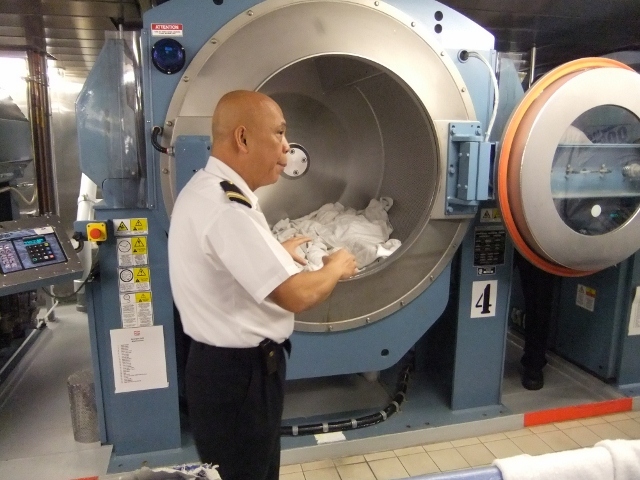 After speaking with the Hotel Director, we had the opportunity to take a behind the scenes tour of the ship, including the kitchen, galley and provisions areas, bridge control room, laundry facilities, waste disposal center, and theater. 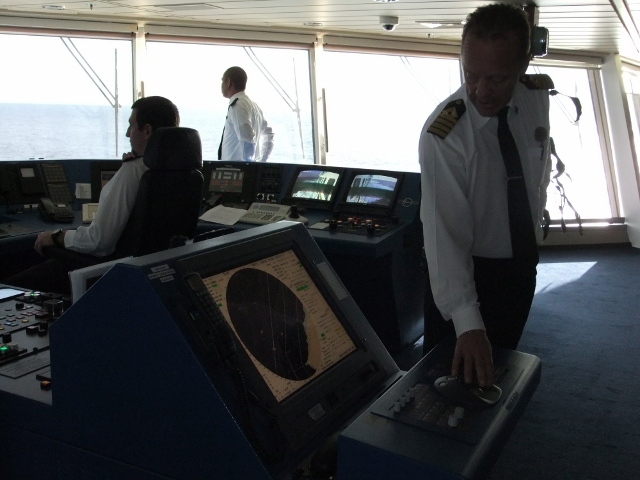 We were amazed at what goes into making a cruise happen smoothly and seamlessly. We had a fantastic time at sea and it was a great opportunity to rest up, eat three (or more) good meals per day, and prepare ourselves for the upcoming month of hostel living and a relatively unknown itinerary. We are now in Valencia and looking forward to exploring the home of paella!